A tale of three drinks: Wine, Detox cocktails and Smoothies at Opus restaurants. Some of us at this time of year are thinking of either our health or our wallets or both. Birmingham Is generally very good at promoting its non alcoholic cocktails, and smoothies, but this month The Opus Restaurants are offering some good deals. 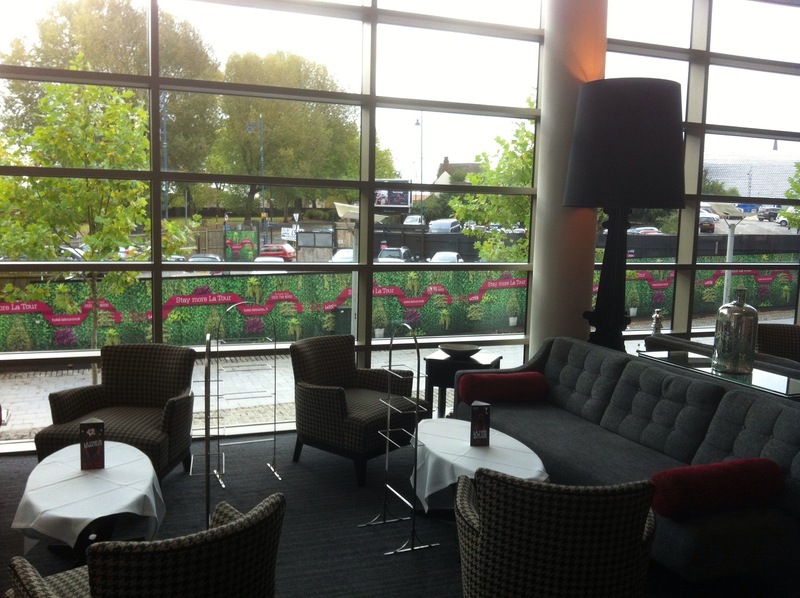 Opus of Cornwall Street have introduced their January Wine Sale – Monday 4th January to Saturday 30th January. From these dates you can Enjoy 50% off selected bottles of wine at Opus at Cornwall Street’s annual January wine sale. 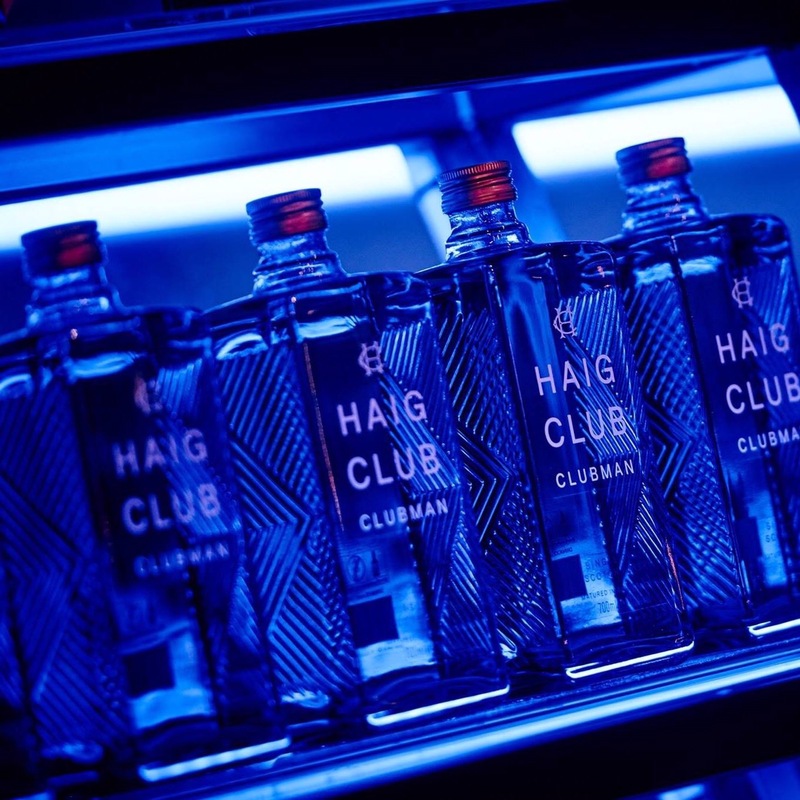 With 18 bottles to choose from including red, white, rose and dessert, wine enthusiasts can enjoy a range of fruity, spicy and velvety drinks. From the powerful but elegant ‘Valpolicella Ripaso’, a deep ruby red that is usually £35 but will cost just £17.50, to the soft ‘Auxey-Duresses Blanc’, a rich but relatively soft drink with orange blossom and lime notes that usually costs £75 but will be just £37.50, this is a fantastic opportunity to enjoy an old favourite at half price or to try something new. The cafe have introduced a number of Detox Smoothies, packed full of healthy ingredients and sold All day, every day. 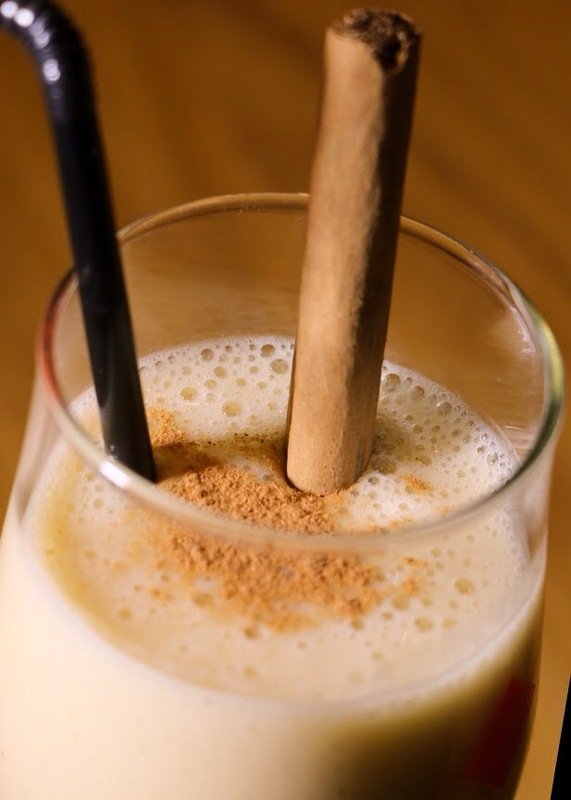 Cafe Opus will be serving three delicious smoothies – ‘Ginger Spice’, ‘Green and Clean’ and ‘All About The Berries’. All smoothies contain healthy ingredients, which are full of antioxidants and fibre to help purge those festive toxins. Each smoothie costs £3.50 and can be enjoyed to drink in or takeaway. 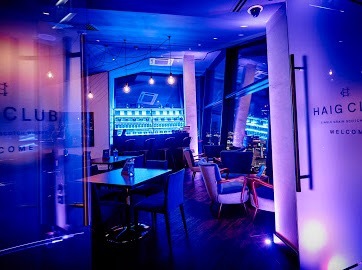 Bar Opus at One SnowHill have introduced a number of Detox cocktails if you are Bidding the booze goodbye this month with Dry January or just want to cut down on alcohol or you are the designated driver. 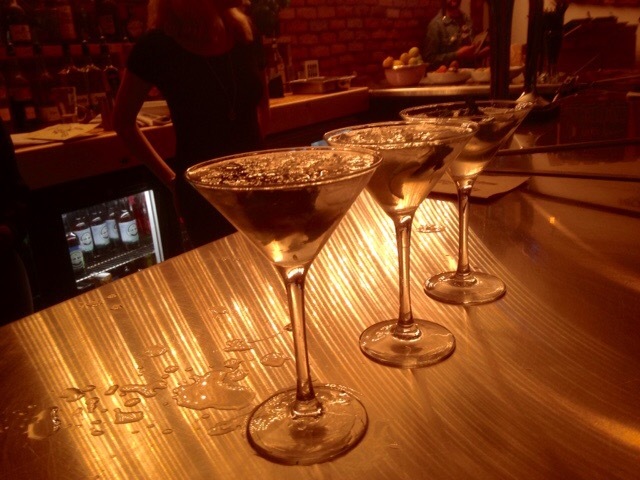 Luckily for you, Bar Manager Sam has whipped up some delicious alcohol-free cocktails for your January health kick. With six flavours to choose from including beetroot, pear, banana, carrot and ginger, apple, and kale and cucumber, these detox drinks are the perfect solution to not drinking but still going out. Cocktails are £3 each or £15 per case of 6. Plus , Bar Opus have introduced Wow Weekend – Every Friday and Saturday. If you’ve got an Opus loyalty card then enjoy 50% off Prosecco from 5pm on Friday and all day Saturday. 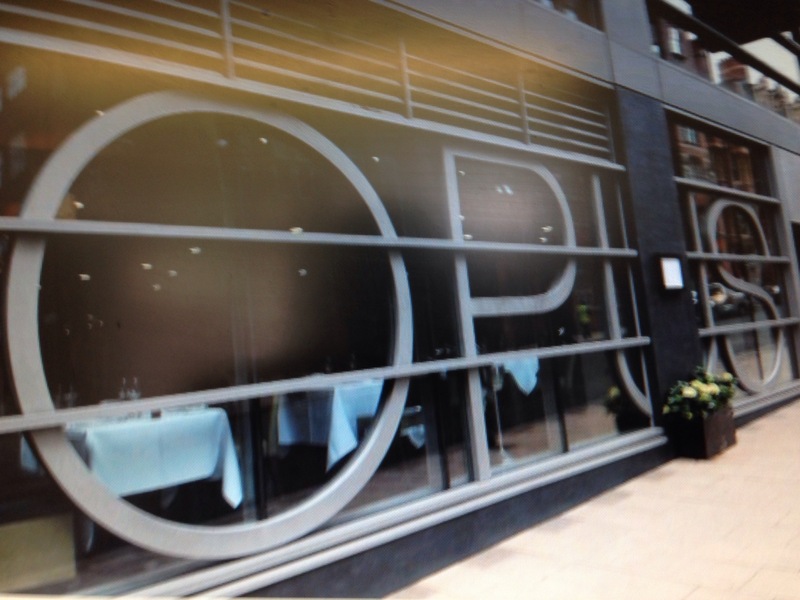 Opus loyalty cards can be picked up from Opus at Cornwall Street, Cafe Opus at Ikon and Bar Opus at One Snowhill and can be used in connection with other fabulous offers, including gaining 10p points for every £1 spent. Whatever you do this year have a healthy one. 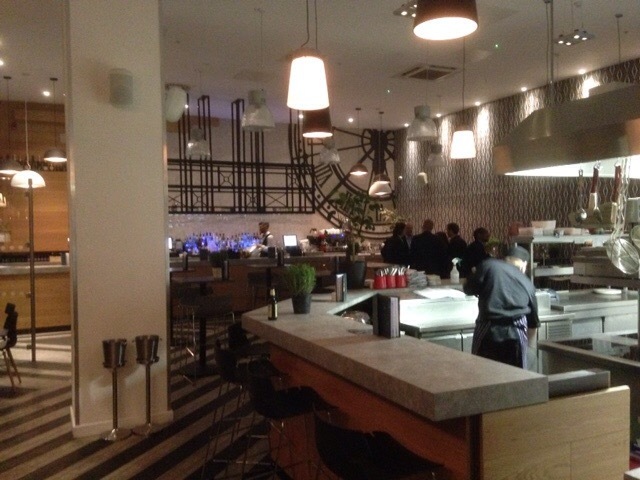 All photos apart from one are courtesy of Opus Restaurants. 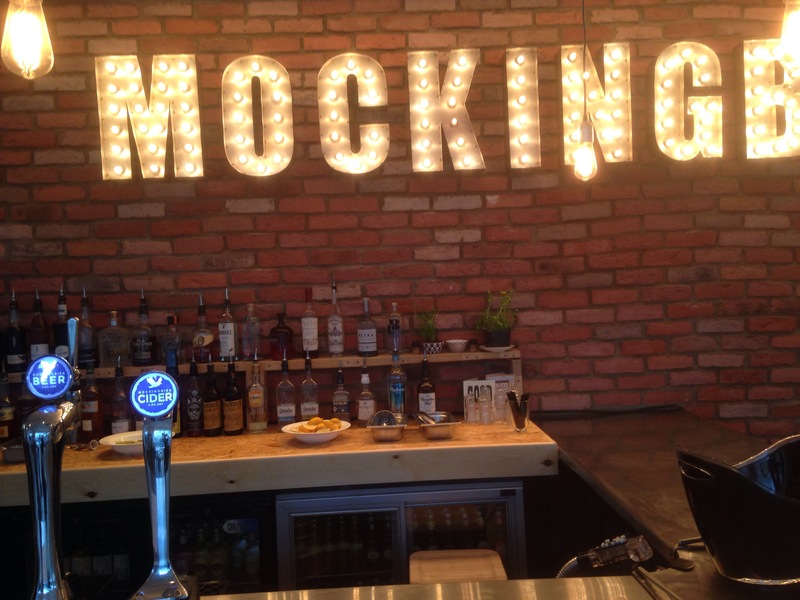 Review: Mockingbird, Custard Factory, Birmingham. Anyone who went to Big Papas at The Sunflower lounge will know the work that Anthony and Craig put into their businesses. What’s always impressed me is their flexibility and nuance in understanding veggie diners and dishes, and what’s put out onto the table. They are open to experiment, your ideas and opinions. 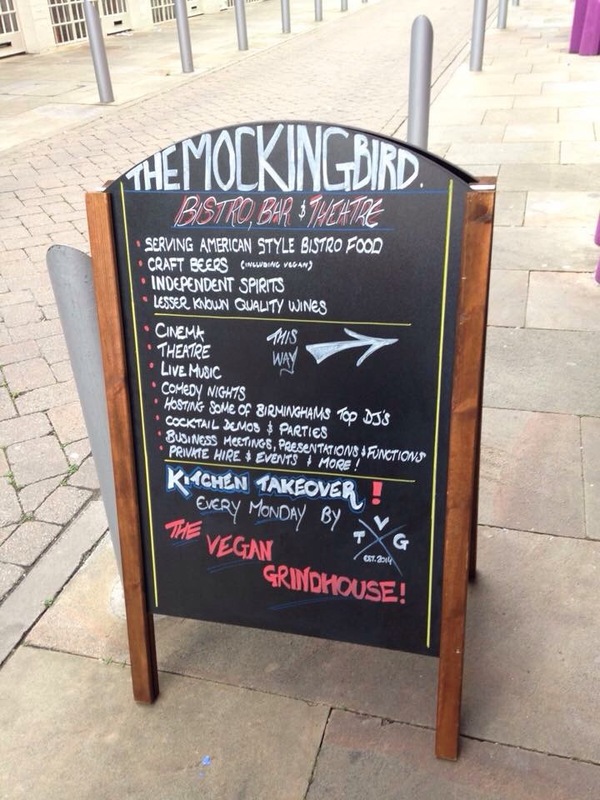 The vegetarian menu at their new venture The Mockingbird, Bar, Bistro and Theatre is evolving. It’s early days, it’s short at present, a bit too short, needs a couple of additions, maybe the Big Papas Mac and cheese, (please) veggie burger, sweet potato fries? why not? Plus think seasonal specials, be imaginative. 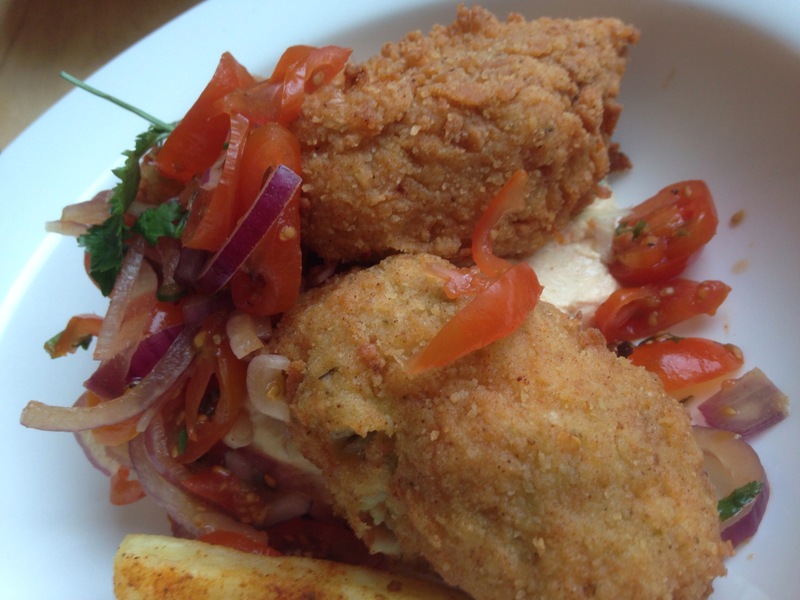 We had the three dishes on the nights menu: Starters: Nachos with cherry tomatoes, salsa lemon and chive cheese, chunky guacamole, garlic and cheese ciabatta, and Main: Cauliflower and Brocolli fritters. 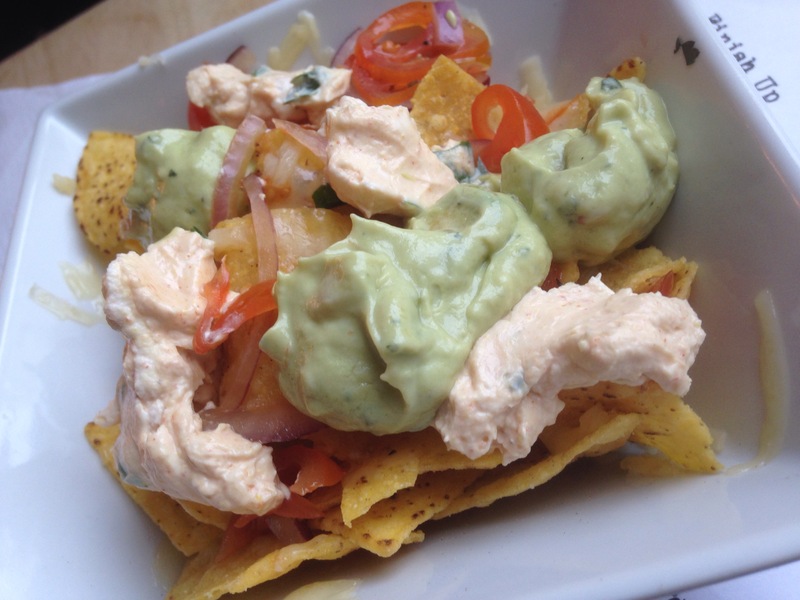 The Nachos, which we shared. A good Tex-Mex dish. 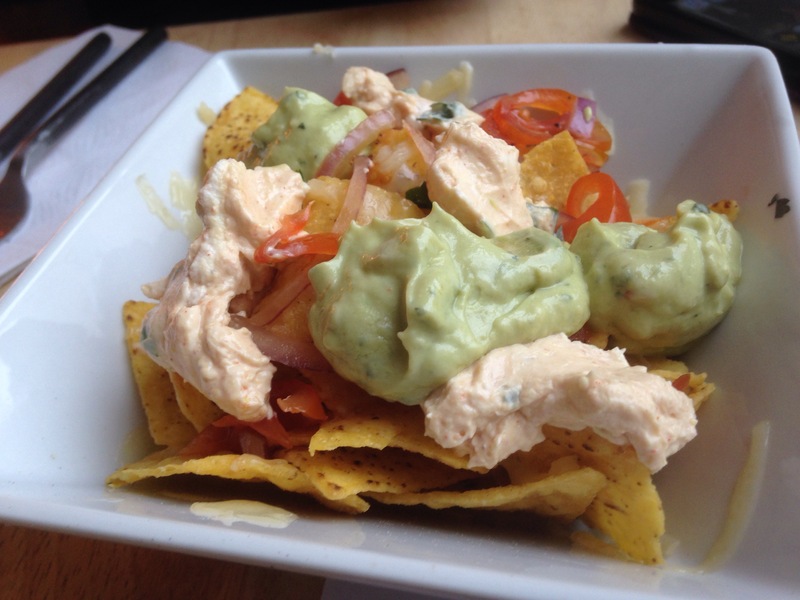 The tortilla chips were crisp, though maybe on reflection the dish could have done with a few more to get the balance right with a delicious salsa lemon and chive cheese sauce and nice guacamole, which slightly overpowered the tortillas for that reason. The flavours were there though and the size was ok for a starter. Could do a larger plate to share as a larger starter. Enjoyed. My fritters had a good and plentiful filling of cauliflower and broccoli and a nice crisp fried outer breading. 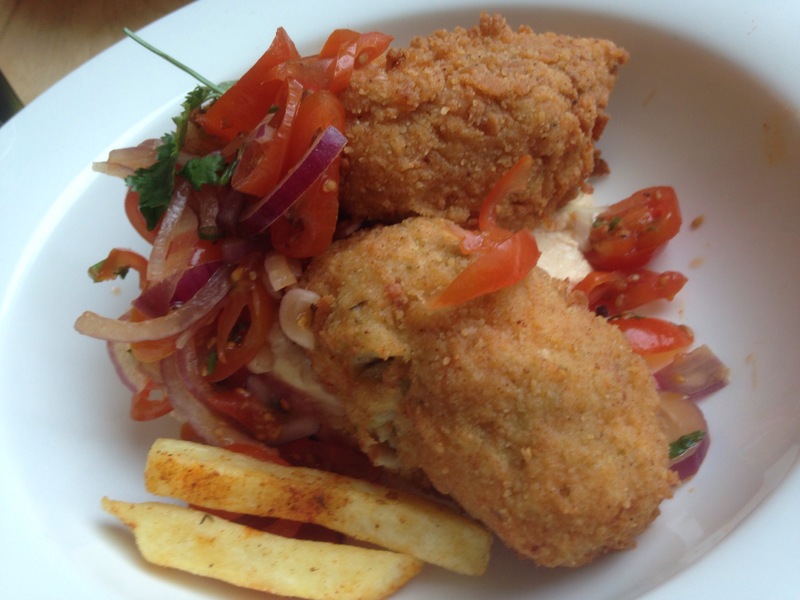 I enjoyed the fritters, the filling was different but had good flavours and filled the batter to leave a satisfying main dish. Again, the sauce that accompanied could have been reduced in quantity in order to get the balance right. I liked the tomato garnish though. Maybe introduce seasonal fillings, courgettes, mushrooms in autumn. I also ate a few of Ruths chips which were ok.
Ruth also enjoyed the Buttermilk fried chicken with fries. She said it was fantastic. Perfectly cooked chicken. She knows, trust me! 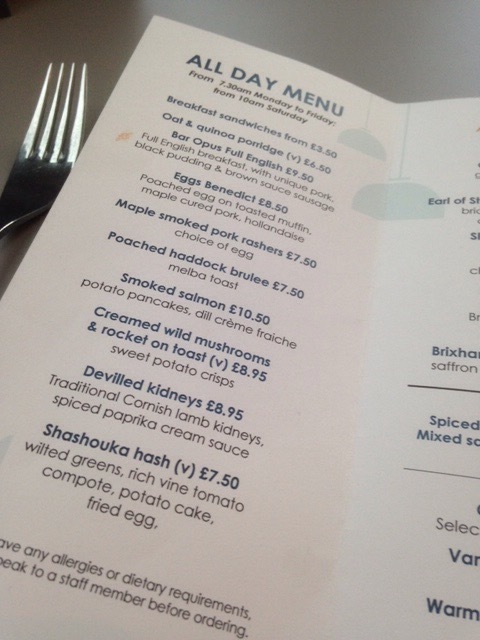 The Brunch menu has a decent range of dishes, all of which can be adapted for the vegan diner. Both Ruth and I loved the music played in The Mockingbird. A mixture, of soul, funk and a bit in between. 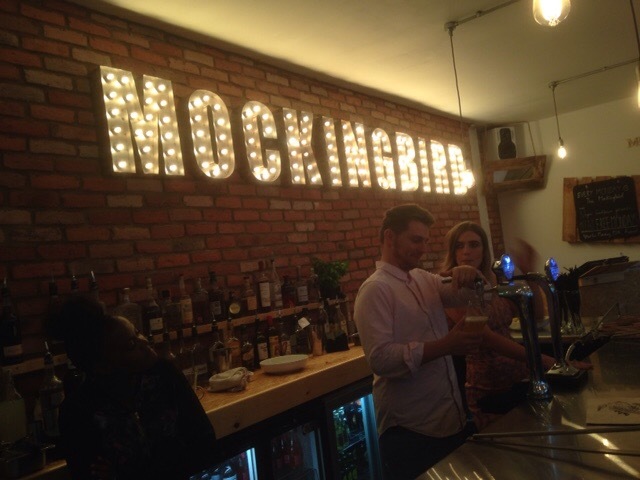 It made for a good atmosphere and on a Wednesday night a steady flow of people were coming in, eating and having a drink before the film that was showing that night at the cinema that The Mockingbird has (Jaws in that case). The menu we had was the cinema/film menu and enabled you to take a desert with you into the film. 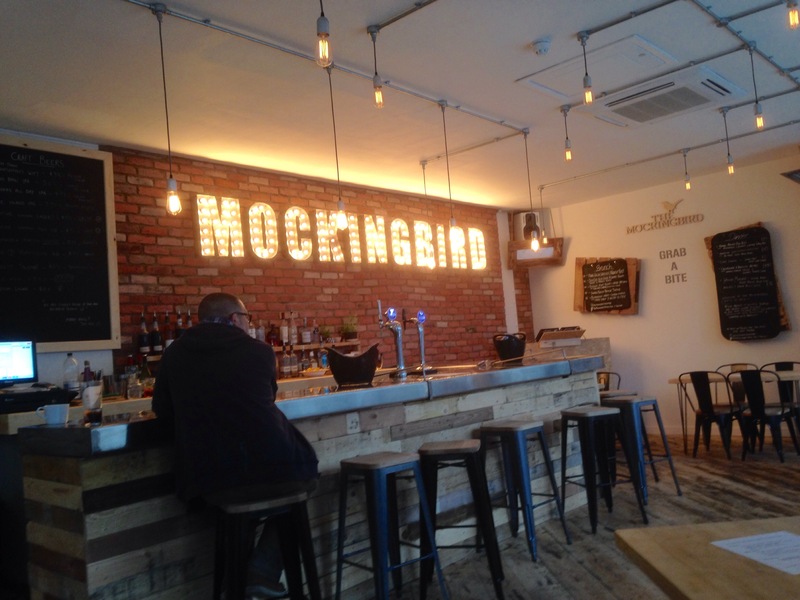 The industrial feel of the decor and seating make The Mockingbird a chilled and relaxing place to visit for food or just drinks. The bar includes craft beers, including vegan beers (marked clearly) wine, and cocktails. 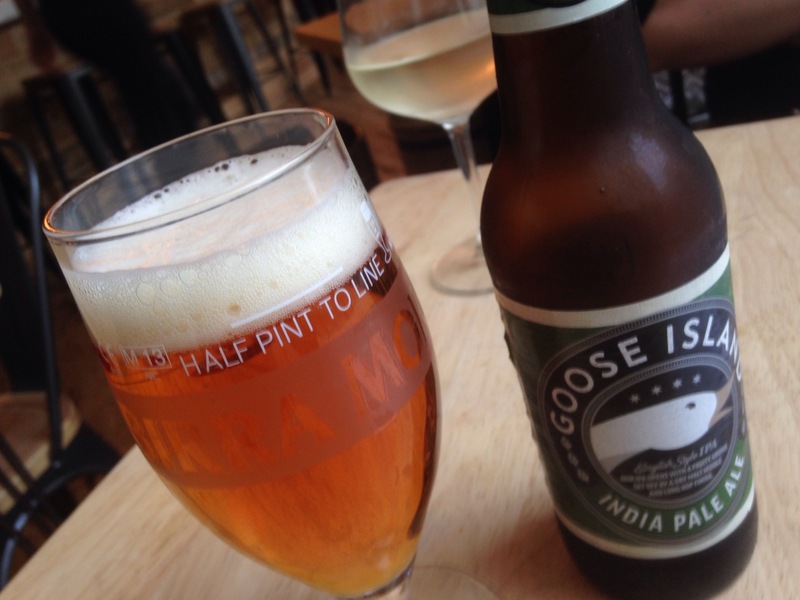 I enjoyed two craft beers, the Goose Island IPA: 5.5% ABV, from Chicago, which has a fruity aroma with a dry malt middle and long hop finish. A very nice beer that went well with the informal food. 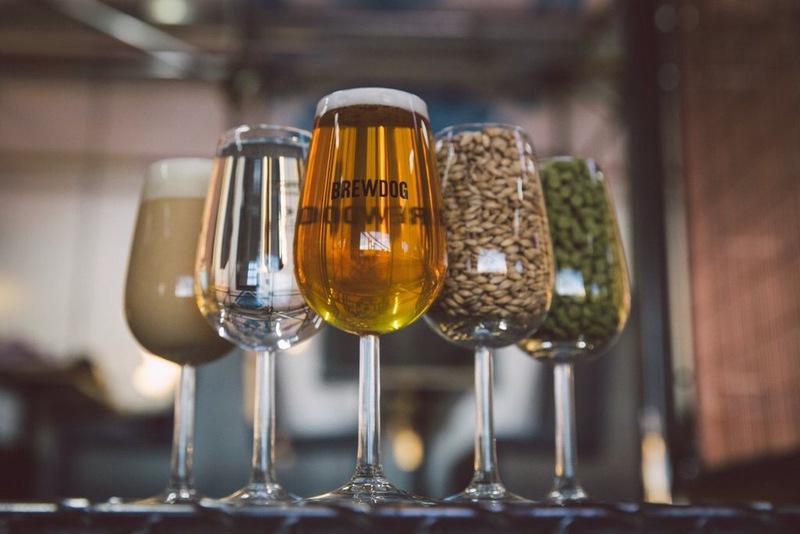 A hop lovers dream. 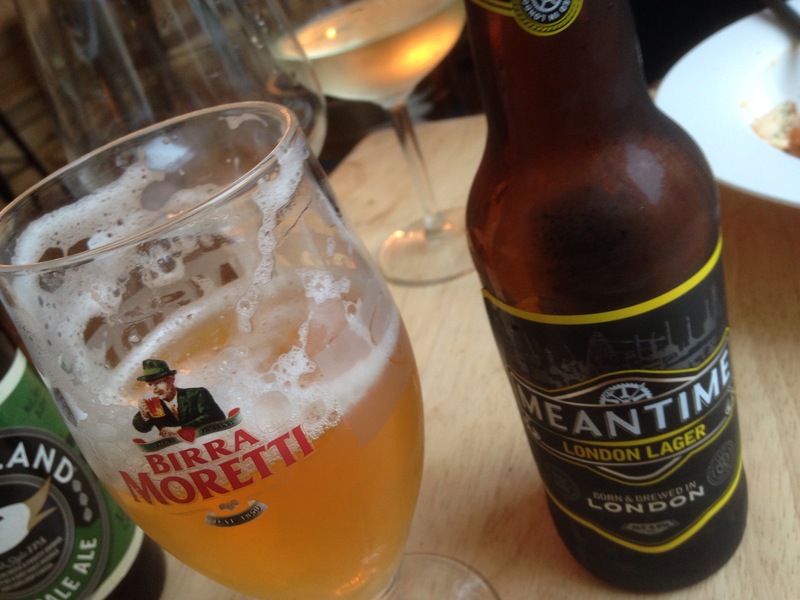 Plus, Meantime London Lager (suitable for vegans) from the award winning brewery based in Greenwich, London. It has the perfect balance of bitterness and hopiness, and is 4.5% ABV. 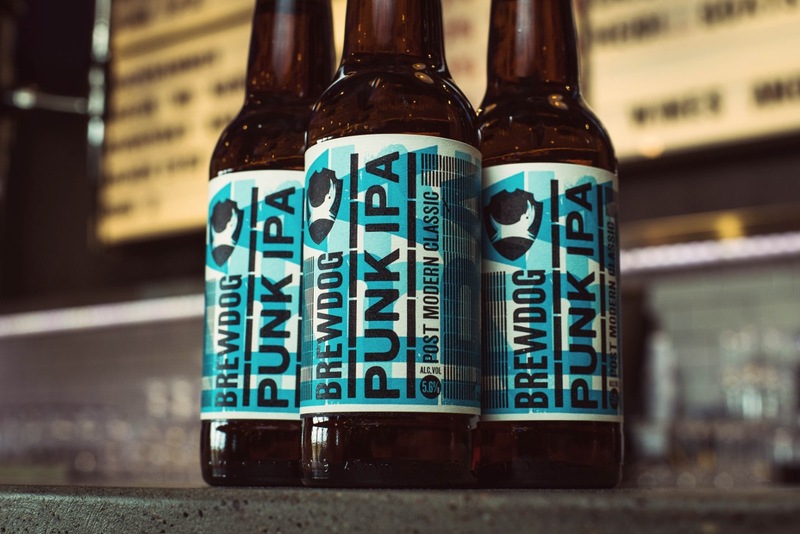 If you like hoppy, malty beers this is for you. A really nice modern English lager, a quality beer. On a weekend they have DJ’s which we both agreed would be a great time to visit as well as comedy nights, a theatre and of course the cinema. 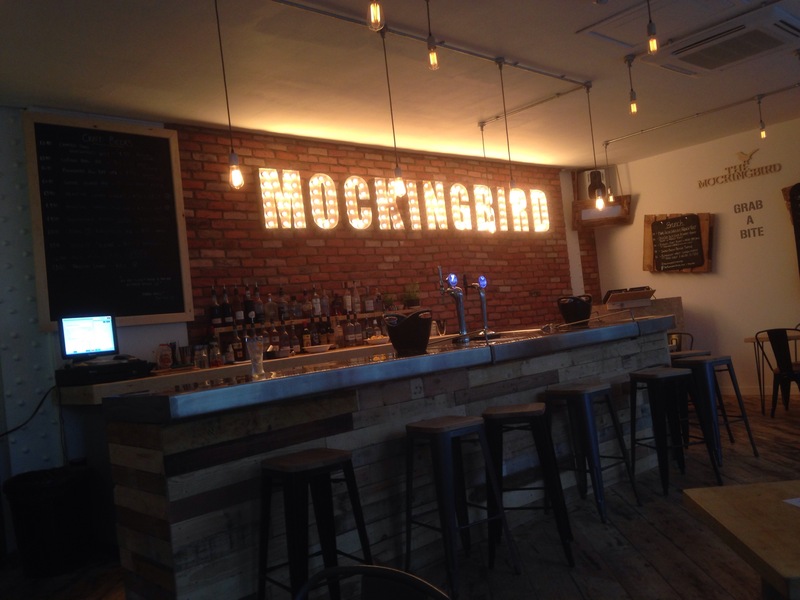 The food at The Mockingbird is well executed, and though the options for vegetarians are limited at the moment, they are happy and excited to develop the menu further and ease the vegetarian and vegan diner. I liked The Mockingbird, in fact loved it. The vibe, the music, the concept. The hard work ethos pays off. I’m excited to see how those veggie dishes evolve and though not perfect at the moment you can see the potential and possibilities. It’s a place to visit at any time of day and livens up the Custard Factory somewhat in the day and for that it is achieving its aims well. 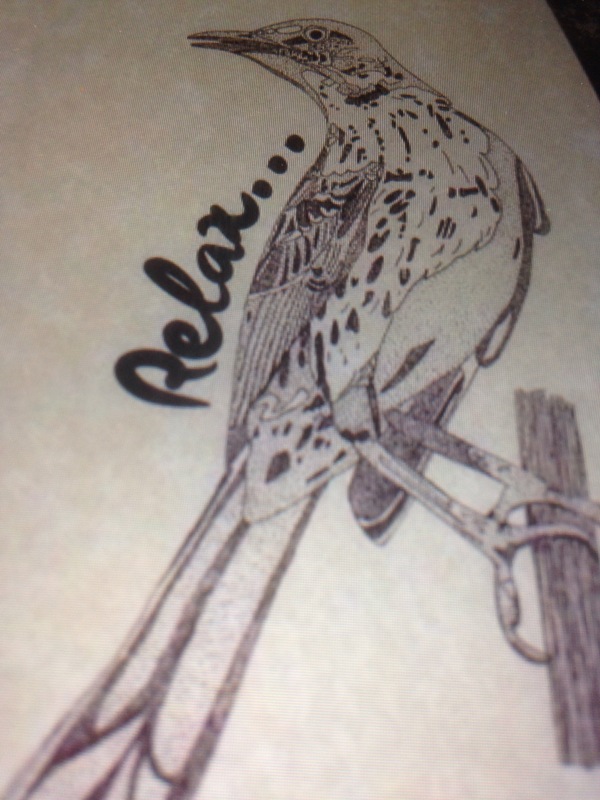 The owners Anthony and Craig have the heart and soul for The Mockingbird, and yes this bird can sing. 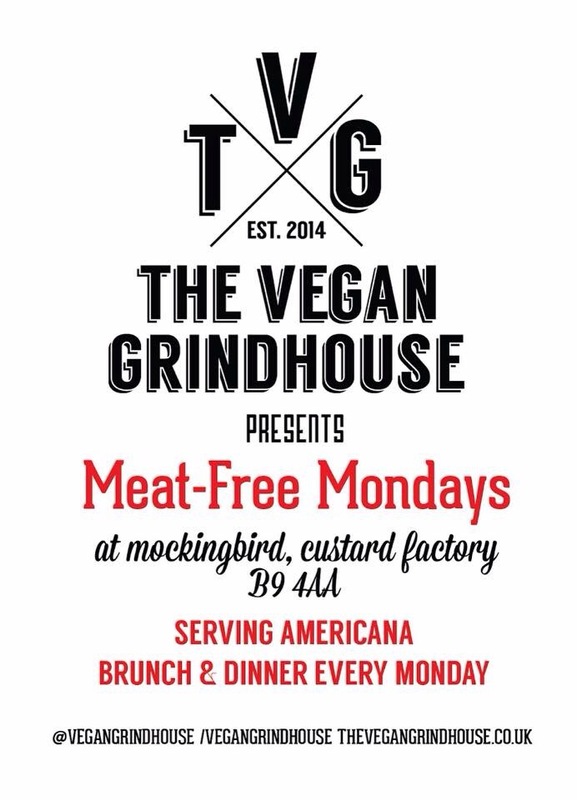 Every Monday is Meat Free Monday at The Mockingbird with The Vegan Grindhouse taking over the kitchen. 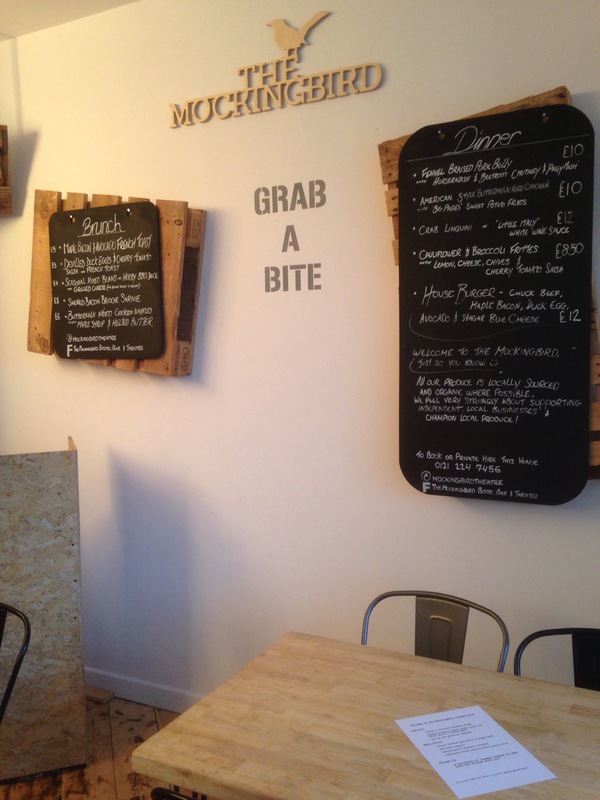 From Brunch/lunch to dinner keep an eye on social media for menus and guest chefs/Streetfood traders. See Mex it Up on Monday August 31st. 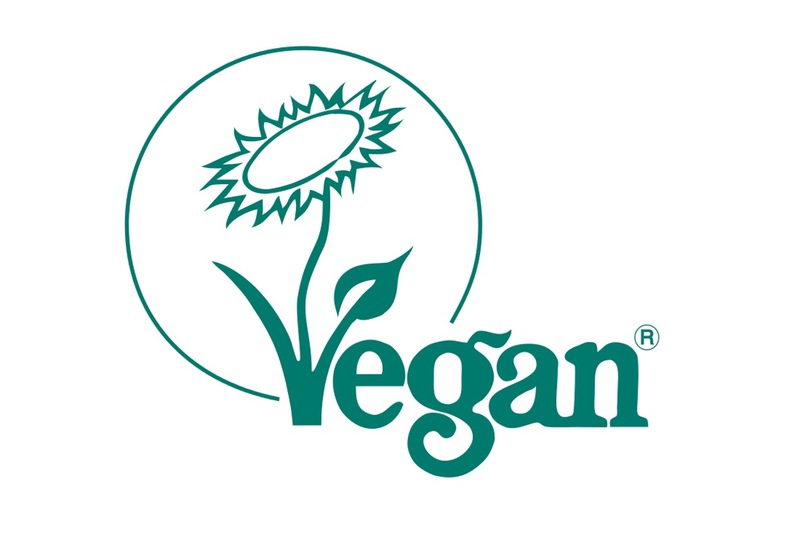 Vegan Mexican street food. Guest kitchen. 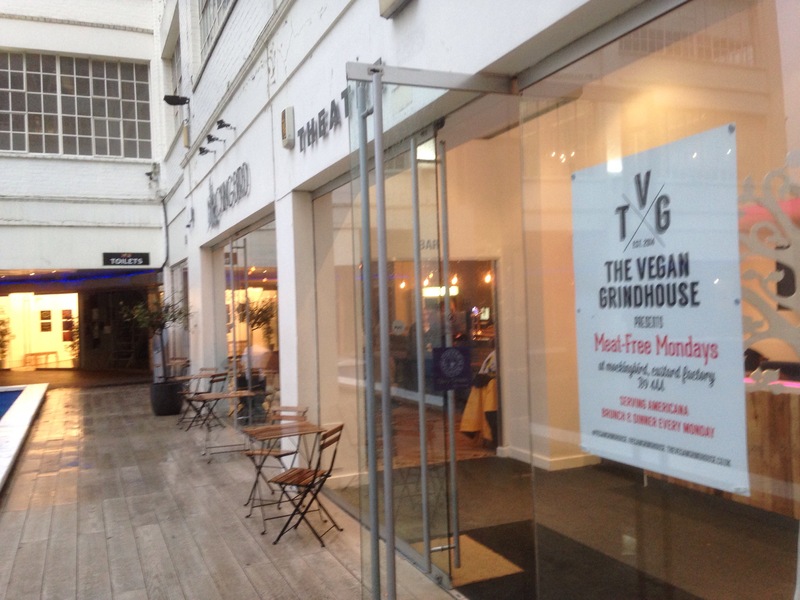 See below: re Vegan Grindhouse Meat Free Monday’s. Disclosure: Ruth and I were invited to visit The Mockingbird. Our food was complimentary but we paid for all drinks drank in full. In no way did this make my views biased which are honest as always. 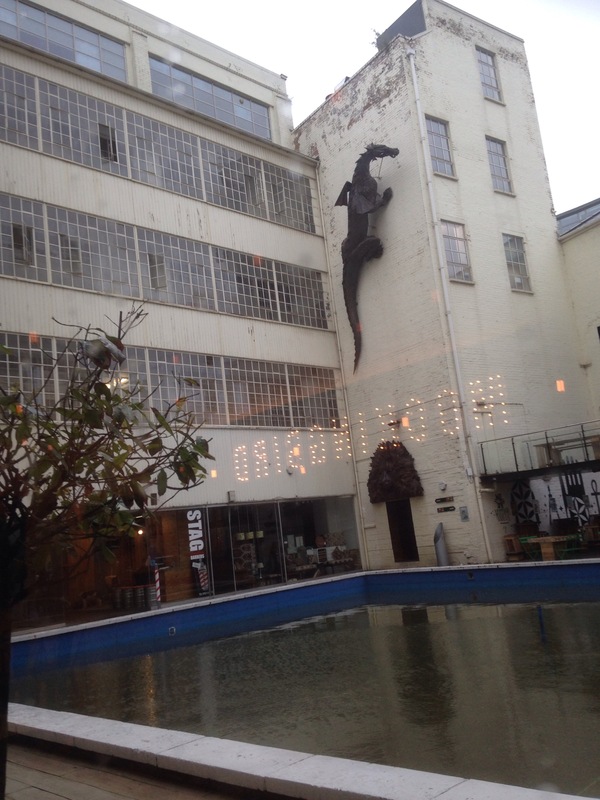 The Mockingbird, the Custard Factory, Gibb Street, Digbeth, B 9 4AA. 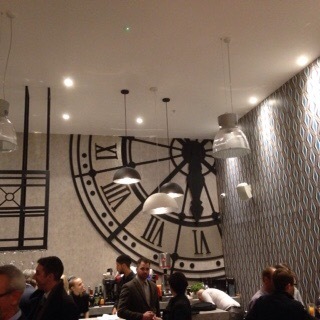 Bar Opus: Snow Hill, Birmingham. 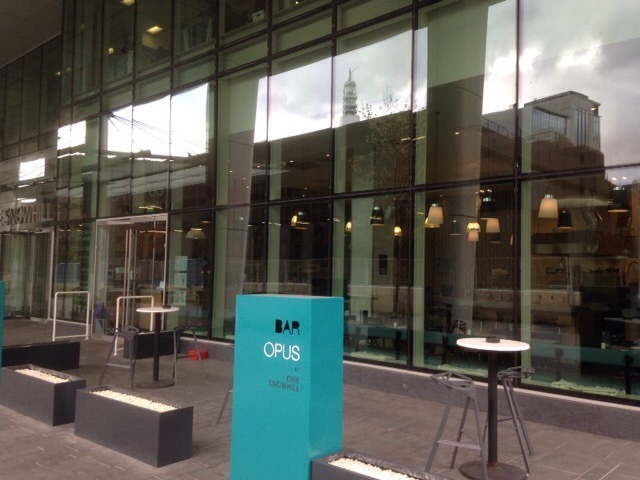 Bar Opus is the youngest sister in the Opus family that includes Opus on Cornwall Street and Cafe Opus at the Ikon Gallery. 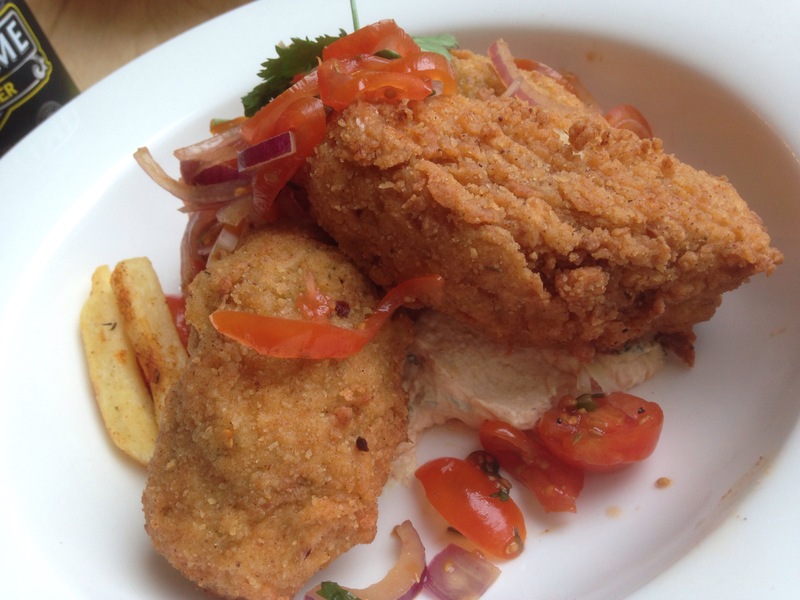 The other week Ruth and I were invited by Anne Tonks of Opus along to try out some of their vegetarian options. 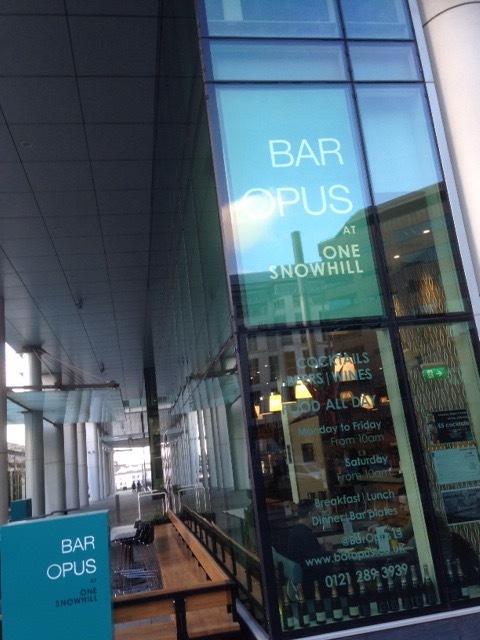 Bar Opus is at No’ 1 Snowhill in Birmingham City Centre, a new complex behind Snow Hill Station that is next to the new Midland Metro team line which should be complete shortly. It has a nice terrace that is primed for Summer and its reincarnation into something more uber cool in the forthcoming months, imagine those long cocktails, bar snacks and lazy afternoons. It’s a sun trap in the day and a lunch time favourite. 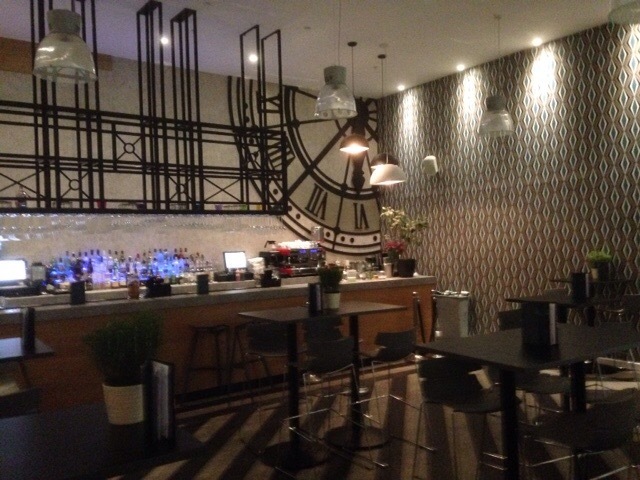 In fact Bar Opus is very continental with its open kitchen and smart decor. Inside its modern, stylish, and has slick lines, in its simple design. It has cosmopolitan floor to ceiling windows, and is filled with thoughtful touches like its internal Parisian like clock face, and it’s well lit interior. 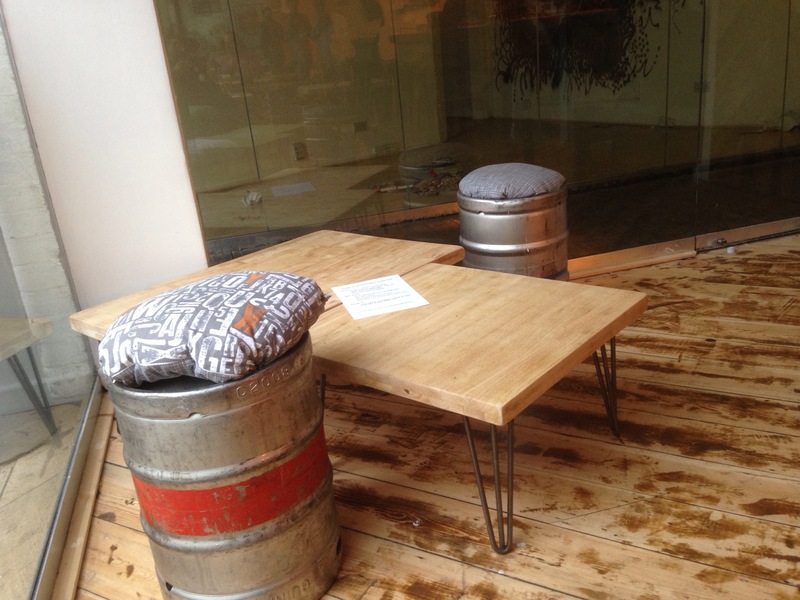 With a mix of bar stool seating and low bearing tables it lends itself equally to drinking and eating. The menu a mixture of bar snacks/plates to eat with those delicious handcrafted cocktails or quality wines or as a starter. Bar Opus has an extensive Breakfast and all day menu and more substantial dishes for lunch time indulgence. The sharing bar plates are varied and with good vegetarian options is one of the best places for informal veggie dining in the city. The Opus family of restaurants have a real skill in making simple ingredients and dishes taste well above the average, and it’s in their ingredient led principles where the flavours begin. The produce though is only half the story, it still has to be cooked and created into an irresistible dish which Bar Opus do well, simplicity in itself. 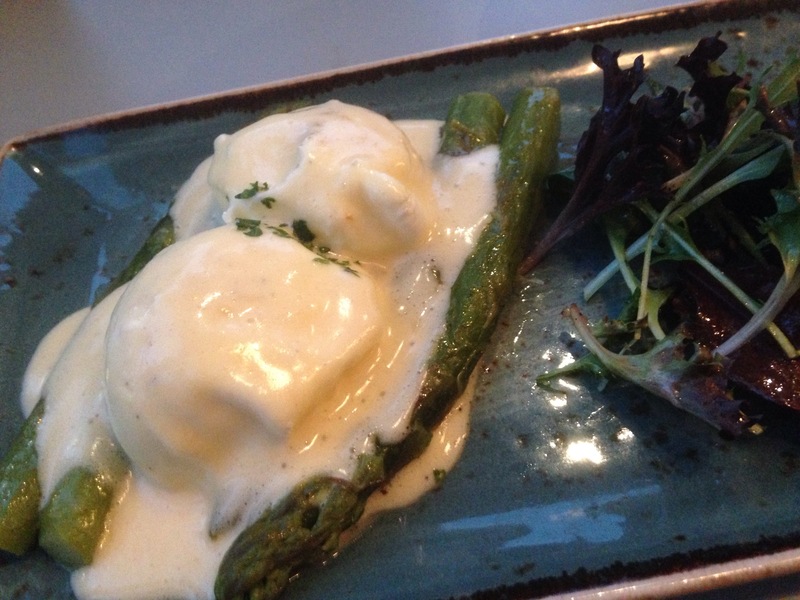 For example our Asparagus, and Hollandaise from their specials menu was cooked perfectly, the dish sang and I feel may not be beaten this Asparagus season, it had a beauty of flavour, creamy, every element cooked perfectly, a real delight. Simple but hard to do in the wrong hands. 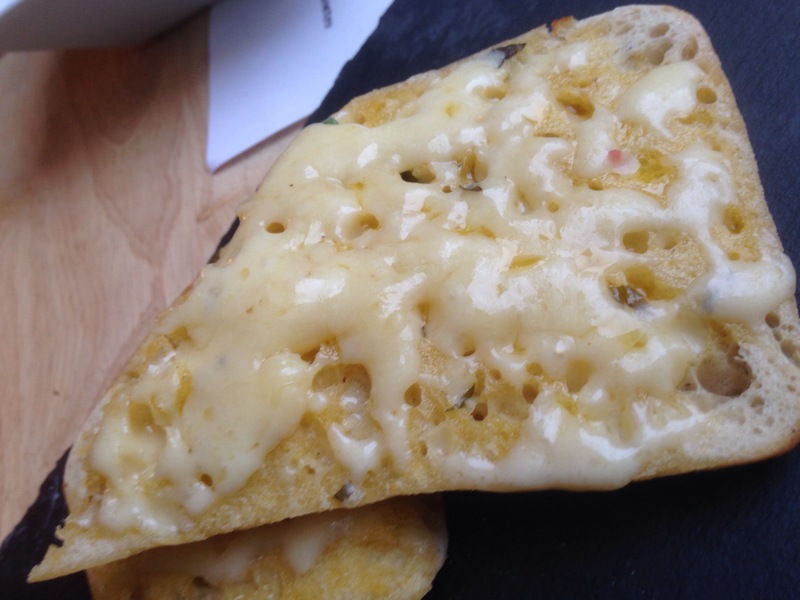 To follow I tried the homemade flatbread with daily vegetarian special. 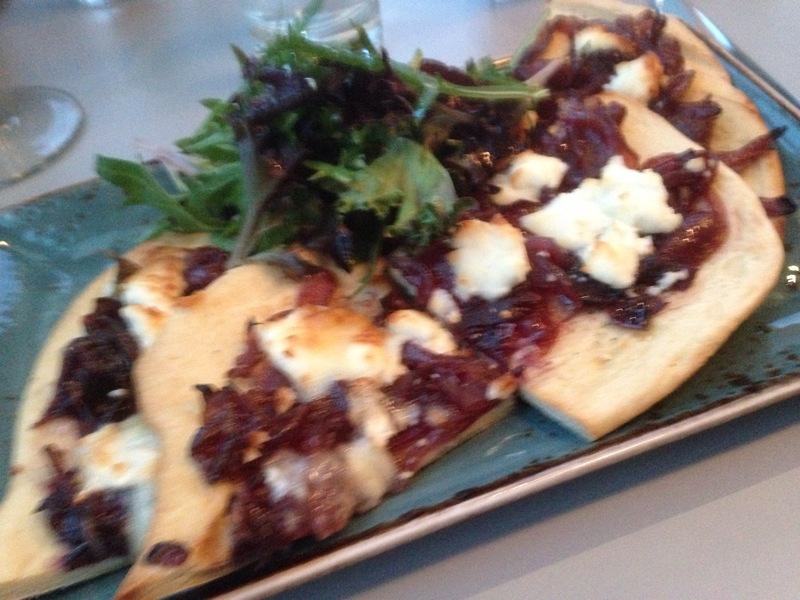 The flatbread, again perfectly indulgent, not over cooked, light, fluffy, with a delicious red onion jam which gave a punch to the dish and combined with feta worked perfectly. 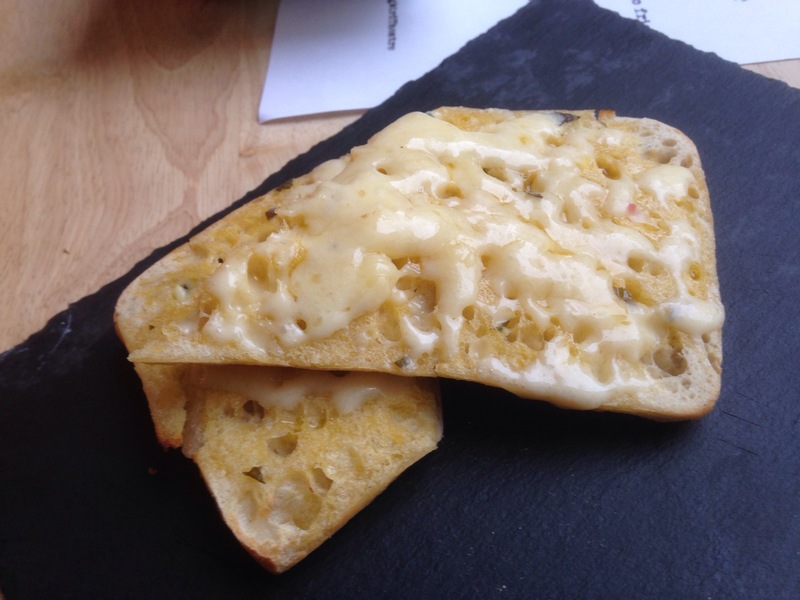 Plus, in its generous size makes a good starter alone or generous sharing plate to tear between friends. To finish our meal I ate the Shashouka Hash, a very popular dish on their all day menu, and one that makes a lovely brunch or lunch dish too. 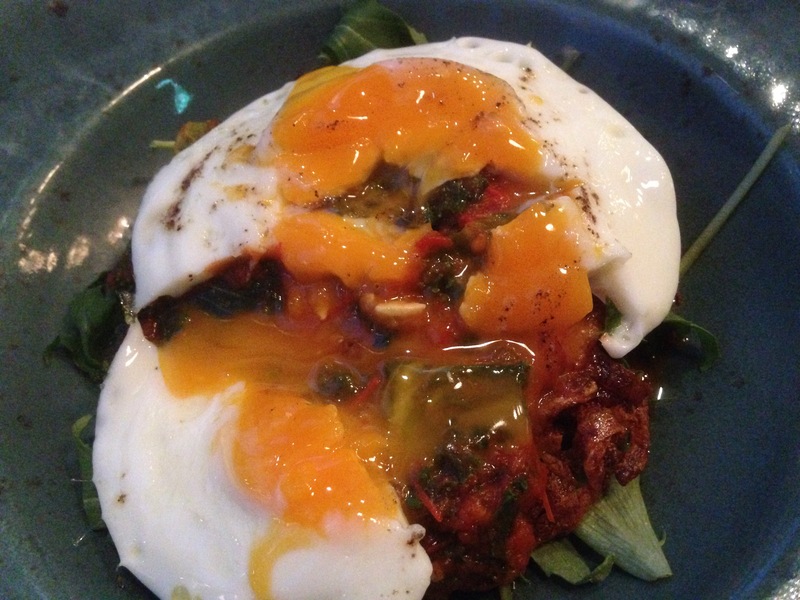 Wilted Greens, rich vine tomato compote, potato cake, and fried egg. The fresh ingredients again shine through, the egg perfectly runny, the tomatoes full of flavour, lifted the dish from heaven to the space that surely must be above that in the veggie foodie world. Warming potatoes and the wilted buttery greens, completed the dish, which I think is a vegetarian must when visiting Bar Opus to eat. Again a simple dish brought to ex halted heights due to the quality of ingredients and the quality of the cooking. Yet, Bar Opus isn’t just about the food, but also the cocktails and a fantastic wine list. 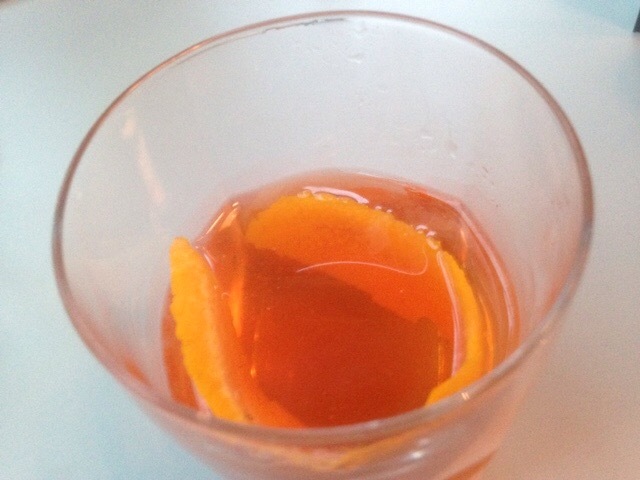 I tried on the night a beautiful Smoked Negroni. Now a negroni always reminds me of Italy. Lazy evenings in Florence, Rome or Venice. Though I’d never had a smoked variety which came to the table theatrically smoking and yes winking at me. 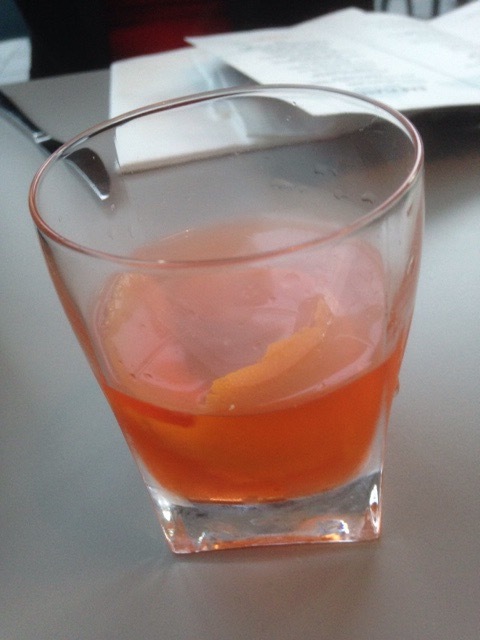 It was delicious, part gin, part vermouth, and then Campari. 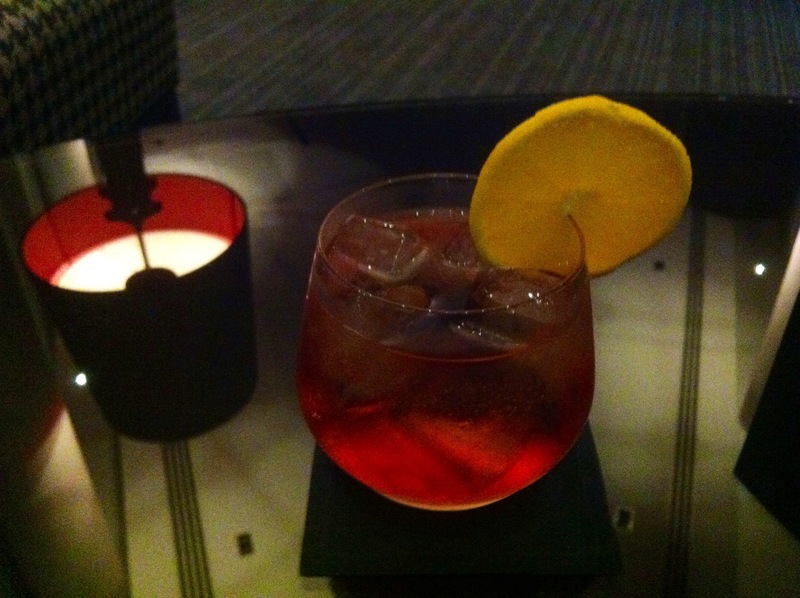 I think Bar Opus make the best Negroni in the city and if like me you love this drink, then try it here. 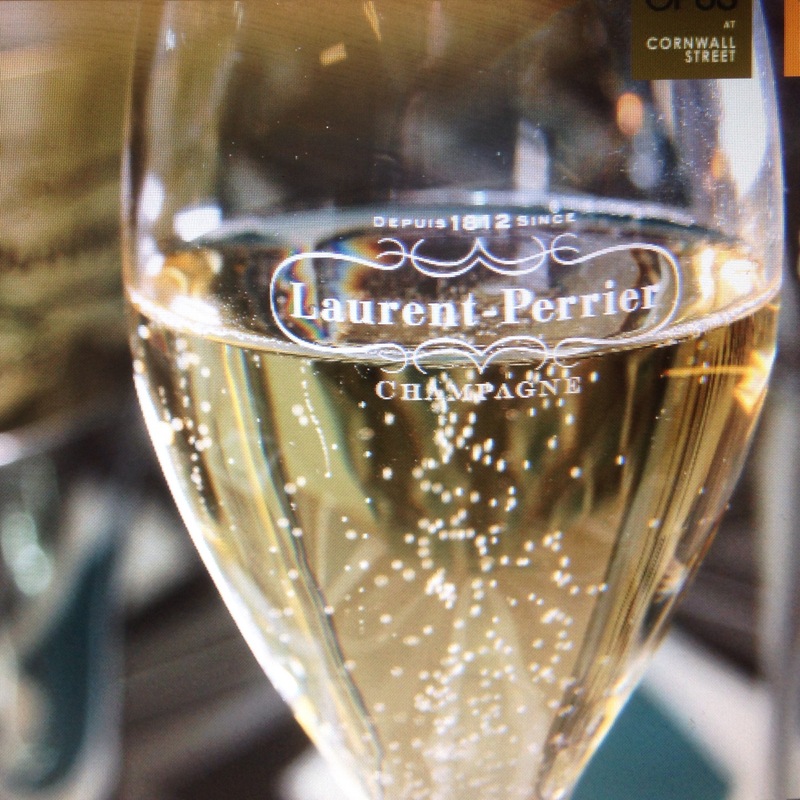 It’s an aperitif, and a classic. Ruth and I also loved the glasses of Pinot Gris we had with our food. 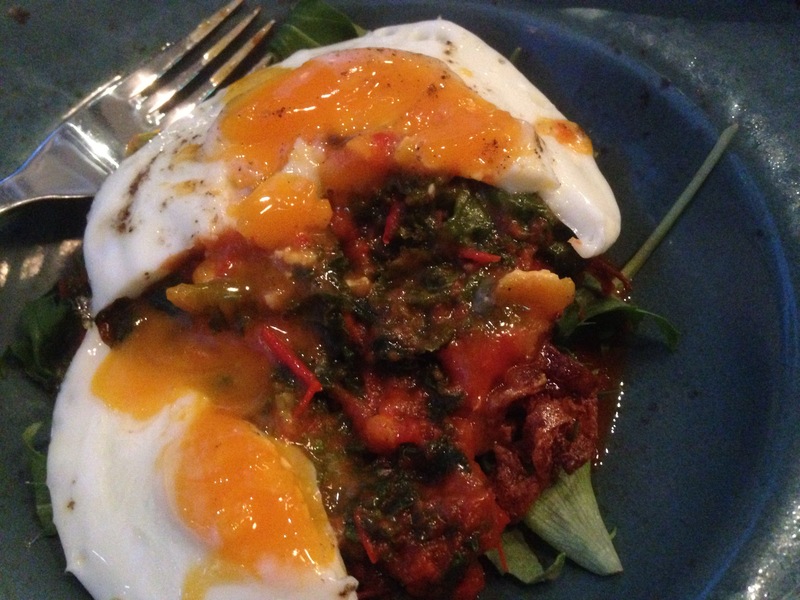 From New Zealand, Dr Renwick, it was light, and complimented the informality of the food perfectly. Lovely. 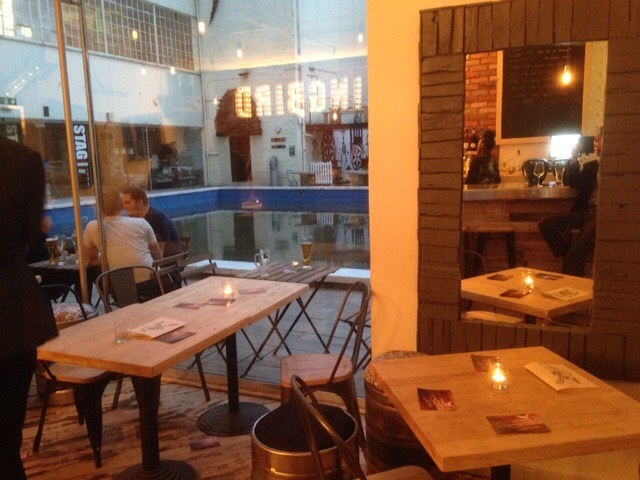 Bar Opus also have a good selection of beers, craft ales and real ale. The service throughout was excellent, and was warm, attentive and consistent throughout. Bar Opus is a smartly appointed bar with trendy background music and at times an office like clientele, but don’t let that put you off. It’s sophistication is in doing the simple things well. A mixologist that knows a cocktail from, well, a cocktail. A chef that knows how to get the best out of well sourced seasonal ingredients and creates delicious simple dishes that make you feel hungry even though you may not be. So be tempted. Though the cocktails are the pull, the ace on top the pack of cards is the food, a thoughtful concept, and a gentle buzz, a European bar after work, but please don’t tell David Cameron because he may close it down, European Moir…for vegetarians its up their with the best Birmingham can offer, good dishes made well, decent choice, well made, sound drinks. And with the Summer approaching a place to chill outside and take in the sun, hopefully. 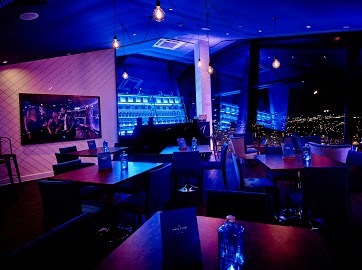 Bar Opus is an all day venue that you may not leave, I like it, so do others, it’s the city bar redefined. Now where are my Euros. 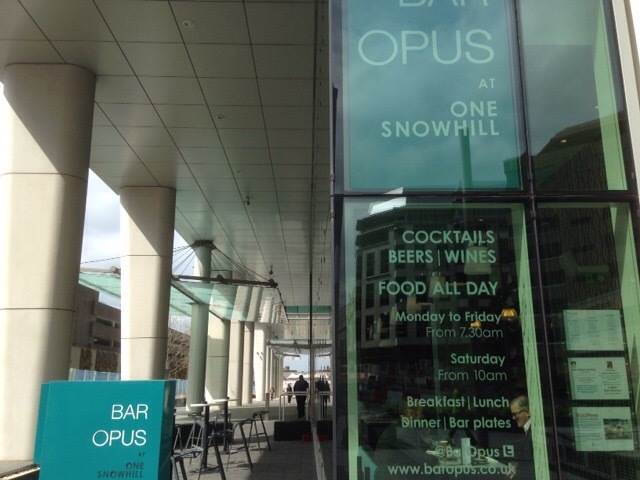 Bar Opus, One SnowHill, Birmingham, B4 6GH. 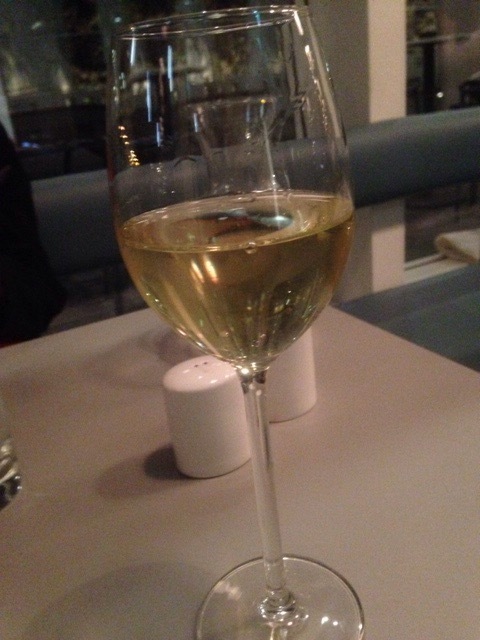 My previous review of Bar Opus. 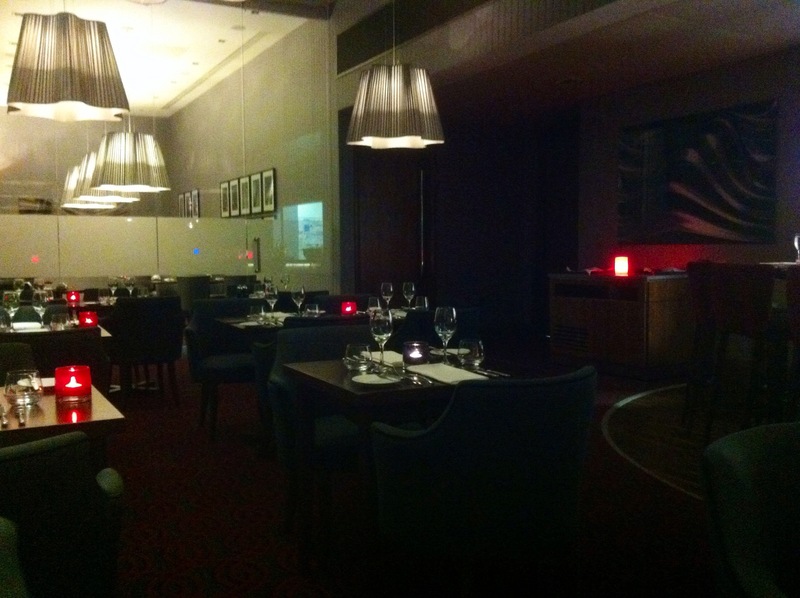 We were invited to Bar Opus to review some of their vegetarian dishes. Our food was complimentary, but we paid for our own drinks. My review is independent of the invite and is honest and carries my own opinions as always. Thanks to Ann for the invite and Sam and Gail for their service and passion for their menus. 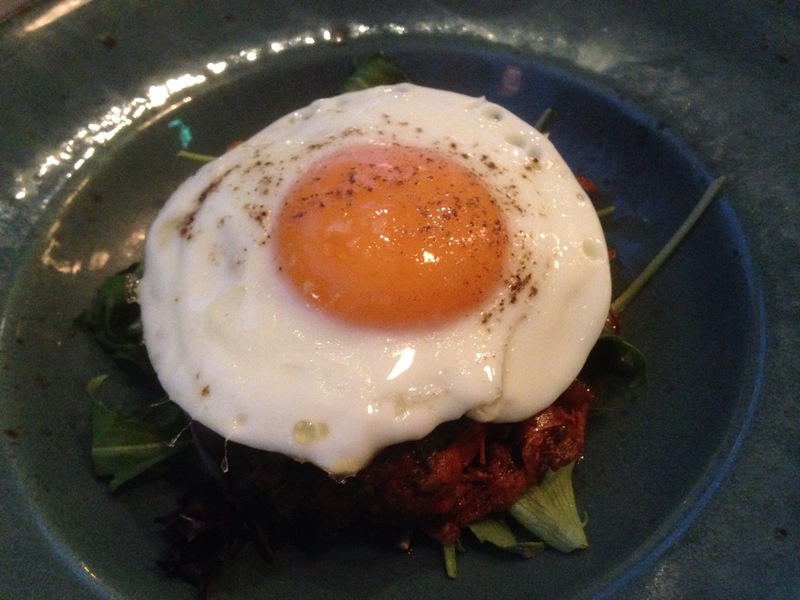 When is a review not a review when it’s an introduction to, as in this case to The Botanist recently opened on Temple Street Birmingham. I was kindly invited to the media lunch before it opened officially to try some of the cocktails and Vegetarian dishes. The Botanist is very impressive to look at, it has a cool chic feel about it, almost cosy pub, but offering more depth and discoveries the further you go in. When you walk through the wrought iron gates you discover an inner conservatory area that I like a lot, a kind of posh parlour. 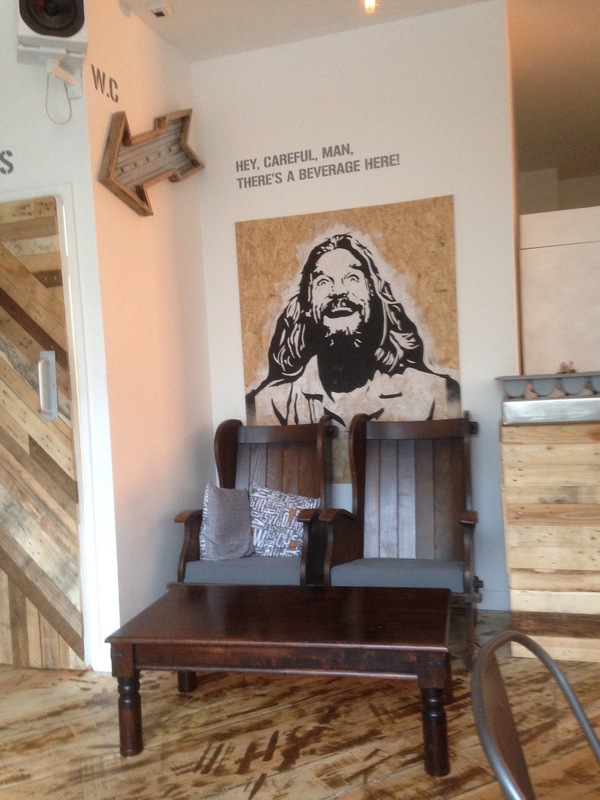 Then through a door into the bar area. Introducing The Botanist, think Gardeners world studying plant life and indulging in cocktails and food, and no carrots and rhubarb in sight. (Well maybe on the menu). The decor untreated wood floors, a mix of vintage looking furniture, quirky chandeliers, watering cans, lamps that are constructed from rope pulleys, and a glorious sky light in the bar area that lets the natural light into an already light bar. On entering I was offered the cocktail menu, which is long (and that’s not just the style of cocktail) which was like reading the what’s what of cocktails and who’s who’s who at the same time. I liked that though. 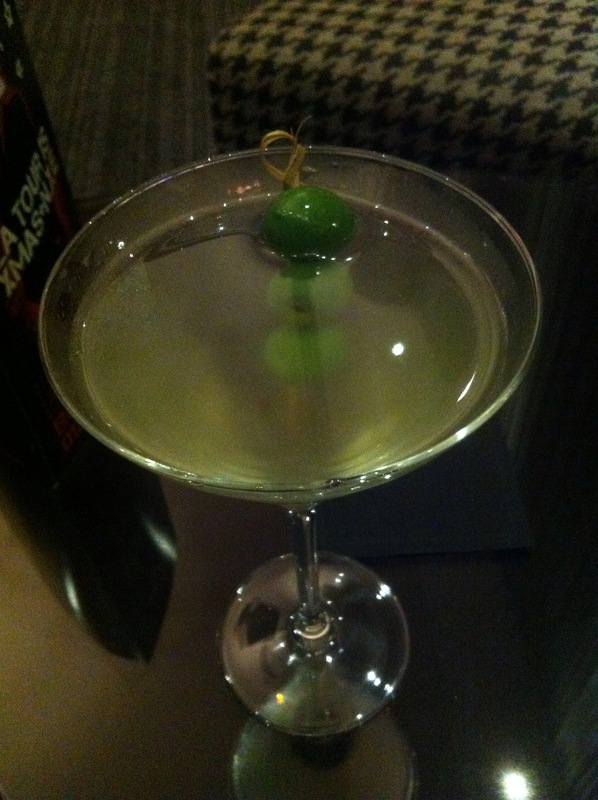 It allowed me to follow my test of asking for a recommendation based on the Martini part of the menu. Ed behind the bar suggested I tried The Botanist Pornstar, ( black cow vodka, and Passoa shaken with fresh passion fruit, strawberry purée, rose syrup, pineapple juice, and lemon, served with a shot of prosecco. 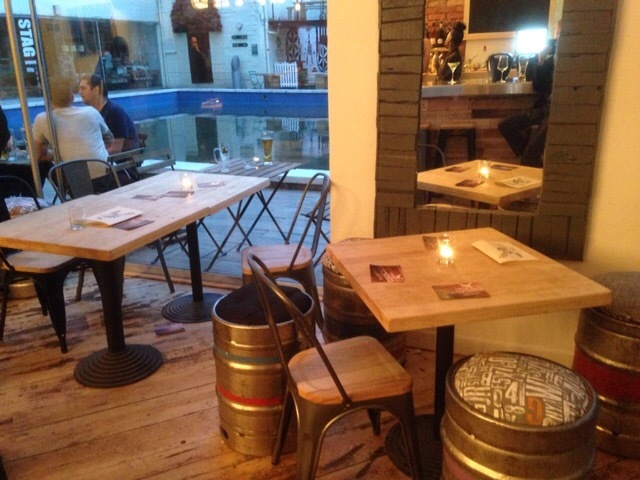 The bar area is quite large, but feel intimate and has a really light airy feel about it. From there you can just about see the restaurant peeking out beyond, which I feel gives a feeling of temptation to move over to that part of The Botanist to try the food, and to explore. The Botanist has an open kitchen which is also fun. It was good to see fellow food bloggers there and after been seated in the restaurant, which is a mixture of table types with some benches, and very nice and light, we were able to choose the food from the menu. I mentioned the menu in my last post. 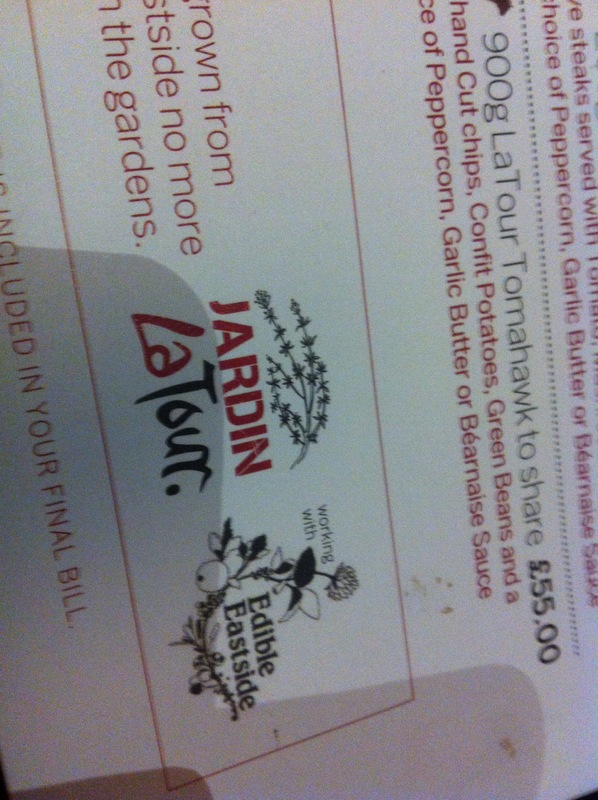 See here http://t.co/xN8TYij74M and mentioned the Vegetarian options. From the starters and nibbles section Pan Fried garlic Mushrooms. With crusty bread and truffle butter. A nice dish beautifully presented in a small wheelbarrow. The mushrooms were fresh, well flavoured, and with a good strong garlic flavour running through made for a lovely starter. Salt and Pepper onion petals: A good nibbling sharing dish, salty, with a nice sour cream to dip into. 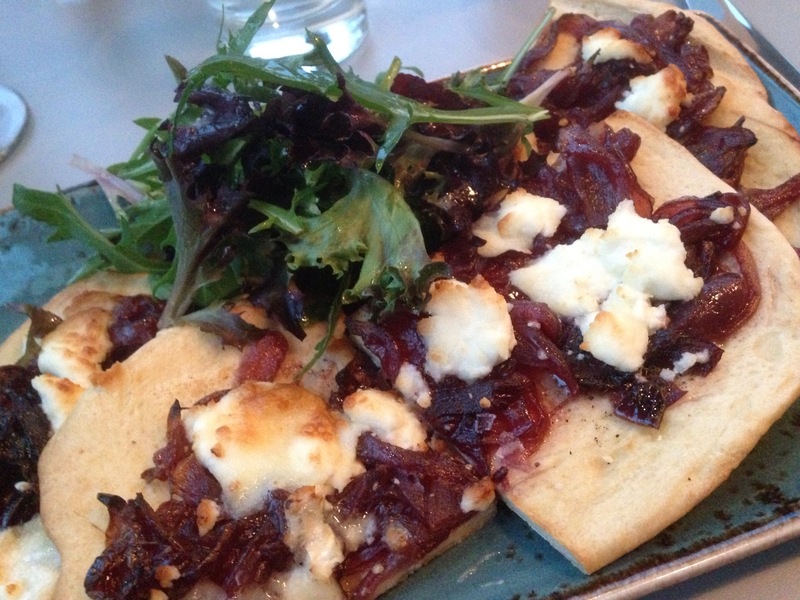 Flatbread: very good bread, fresh and good for breaking. For my main course I ordered the Hanging Kebab with Halloumi and couscous. With a sweet chilli, ginger and garlic butter. A spectacular looking dish, very theatrical. The waiter poured the sauce over the kebab from above so the sauce filtered over the veg and Halloumi onto the cous cous. The sauce added a nice tasty bite to the dish (there was an option to have the kebab with chips instead of cous cous but I felt that wouldn’t work so well as the chips may become soggy and wet fom the dripping sauce). We were given a small plate that the veg and Halloumi can be eaten off with the cous cous. The Hanging Kebab with the cous cous worked well as the sauce gave it a coating that made for a fuller rounder flavour. The Halloumi was well cooked, but could have done with a couple more pieces in my opinion. The veg was cooked perfectly and the dish looked fun and smart. I also ordered The Botanist cocktail green mark vodka, Havana 3 Rum, elderflower liqueur, red amarinth, mint, jasmine syrup, and lime juice topped with lemonade. I really enjoyed this cocktail, the combinations of vodka and rum worked well and with the mint and juices added a fruity touch that was delicious. I didn’t order a desert on this occasion but hope to on my next visit. I ordered an Americano coffee that was very prettily presented in nice flowery mugs. It was a lovely introduction to The Botanist the service was good, friendly and very informed of the menu and cocktails offering recommendations and having a good knowledge of the dishes on the menu. 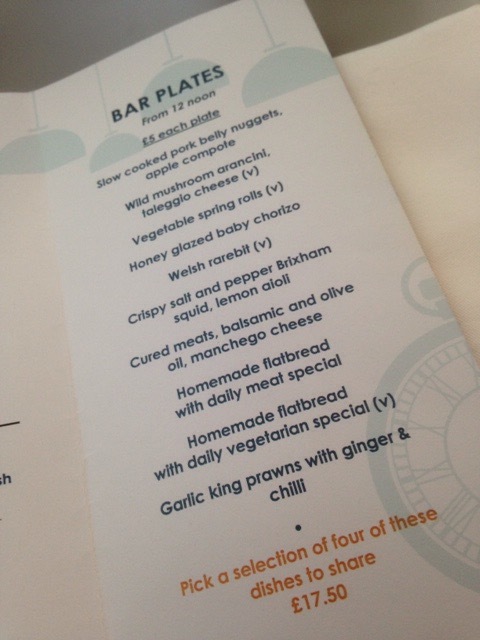 I would on reflection like to see maybe at least one more vegetarian dish on the main menu, maybe two as not everyone takes to the smaller plate trend and may not like the kebab. As a chain, that I’m often suspect of, The Botanist seems to have that quirky botanical difference that makes it feel special and unique in the city, fresh like the herbs. Here’s hoping it stays that way, but as a cocktail venue its possibly the best in Birmingham, and offered the most thoughtful and eclectic menu of passionate botanist indulgences and this along with the solidly good Vegetarian food is to be applauded. I was invited as a guest to the preview media lunch at The Botanist and hence the food and drink was complimentary. Thanks to the Botanist and to WPRAgency for the invite. 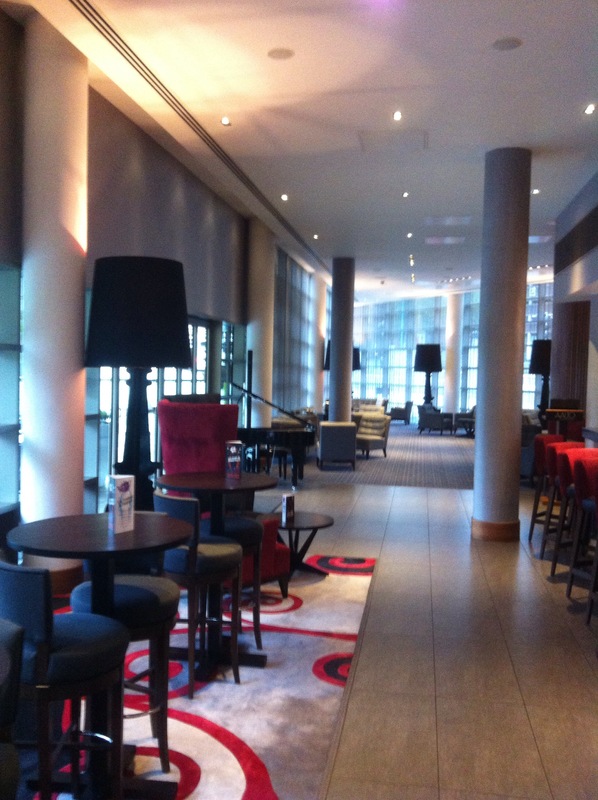 Late last year Ruth and I booked a staycation in Birmingham at Hotel La Tour via the Secret Escapes website. Worth checking on for good deals. 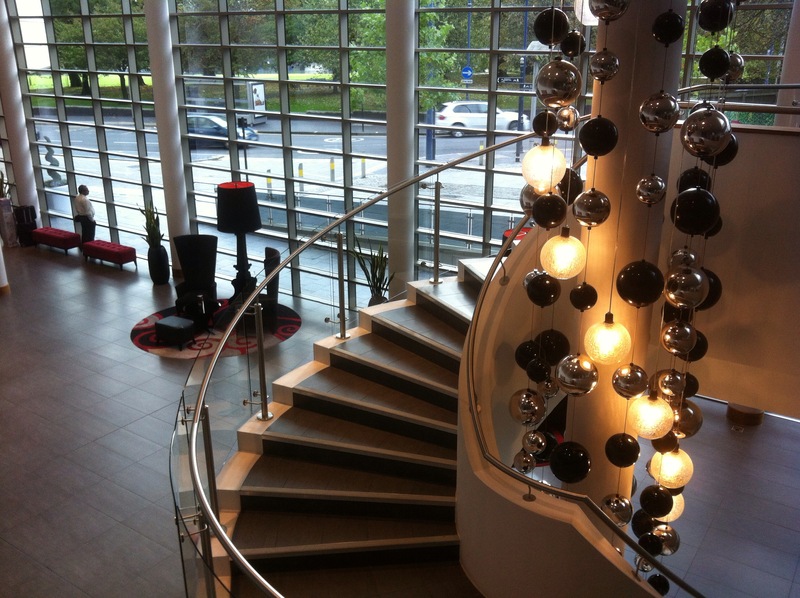 Hotel La Tour is in Birmingham City Centre, on the Digbeth side and is an excellent spot to stay if in the city to shop or take in Brums sights. 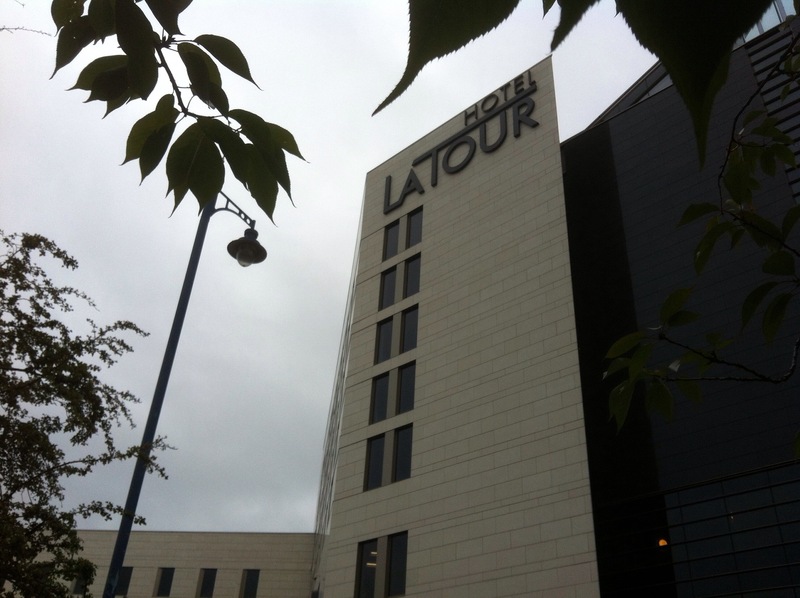 Hotel La Tour is a modern designed hotel that has a chic and quite sophisticated bar called Alvar which is brilliant for cocktails and a brasserie style restaurant called La Tour Grill which leans towards seasonal produce and is a steak specialist and serves a menu of classic British dishes. Presented with a modern twist. La Tour Grill is also excellent for vegetarians as I surprisingly found out. The Hotel has 174 stylish bedrooms which are modern in style and facilities, and on the whole are all you would require for a night away in the city or short break. Though our rooms was more basic than some it was comfortable and had all we required. We had ordered dinner at Grill La Tour. I didn’t expect much to be honest, as a veggie, but I’m a bit cynical sometimes. We began our evening as we do in a bar. The spacious and sophisticated area know as Alvar is a very relaxing and cool space. We ordered Gin Martinis. 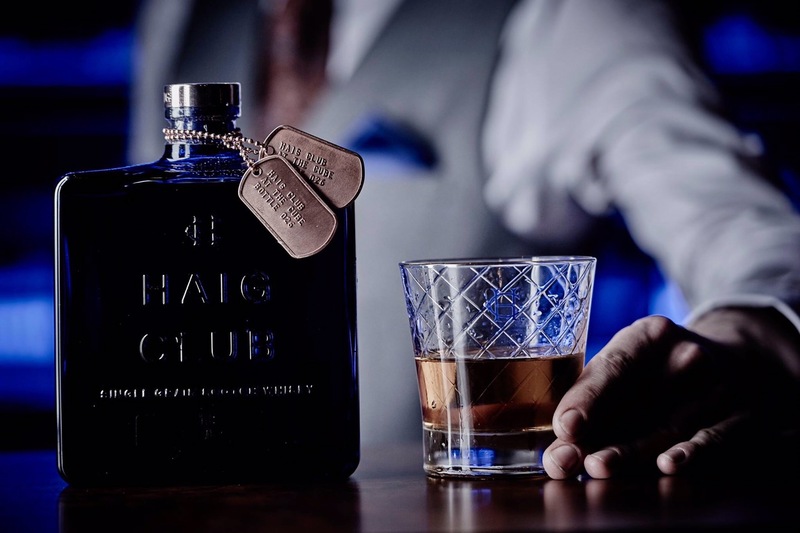 A check of quality, perfectly made, classy. It hit the spot. We had booked dinner at La Tour Grill. 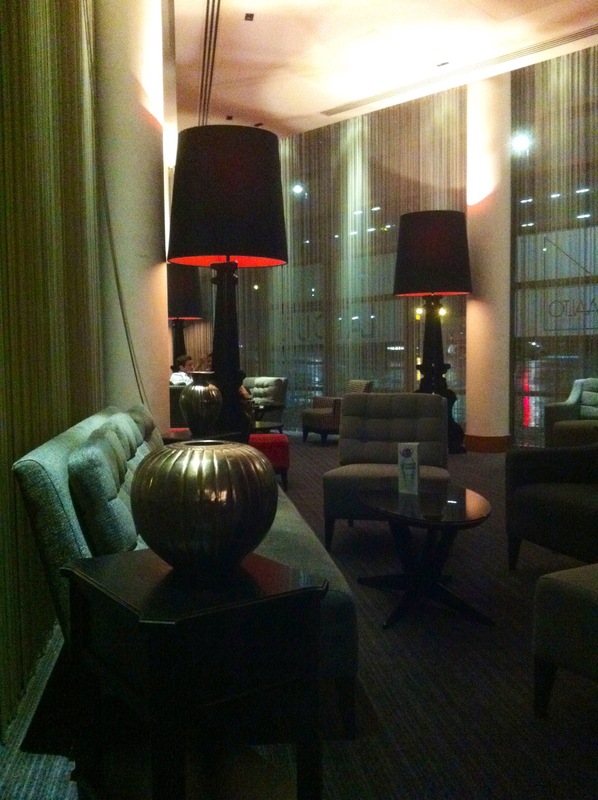 A lovely space, with perfect lighting, and though large it felt more intimate than on first impressions. A real grower. 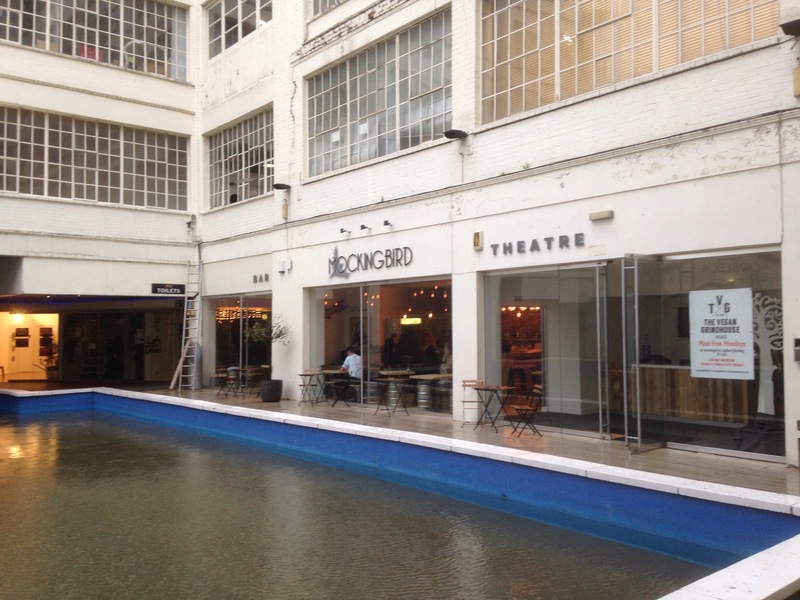 Edible Eastside in nearby Digbeth that I’ve championed before on this blog. The Brasserie caters well for vegetarians with some options on the menu but on discussion with the waitress they had many more unseen and un menued veggie jewels that can be made upon request. 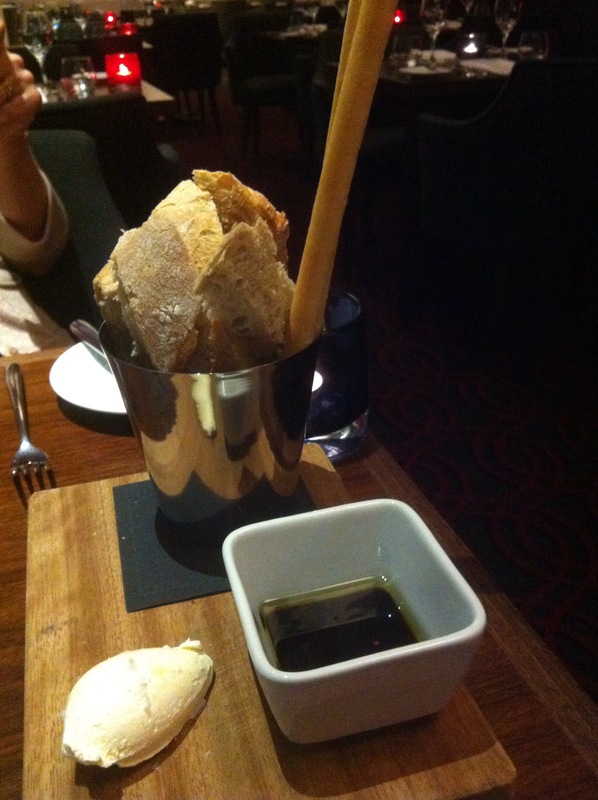 The waitress brought some excellent assorted breads to the table to eat whilst looking at the menu. These were varied, crisp and presented well. Always a good sign if the bread is of high standard. I decided to order off the main menu. 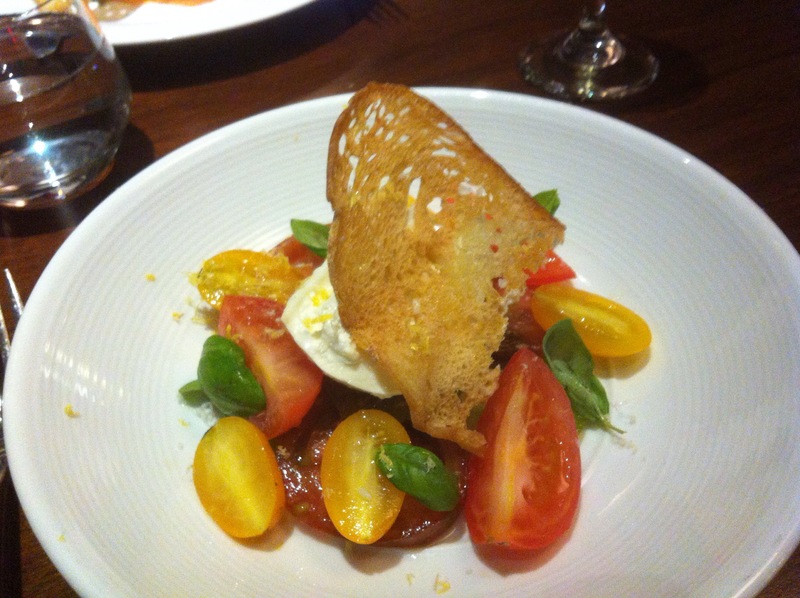 I began with The Heritage Tomato and Burrata cheese salad. A lovely starter. The tomatoes were fresh, grown on the roof, had a beautiful flavour and were both yellow an red in colour. Against the Burrata cheese you could imagine you were in Italy it tasted so fresh. The dish was also impressively presented. A simple dish, done well. Sounds easy, but rest assured i’ve had some rotters in my time. 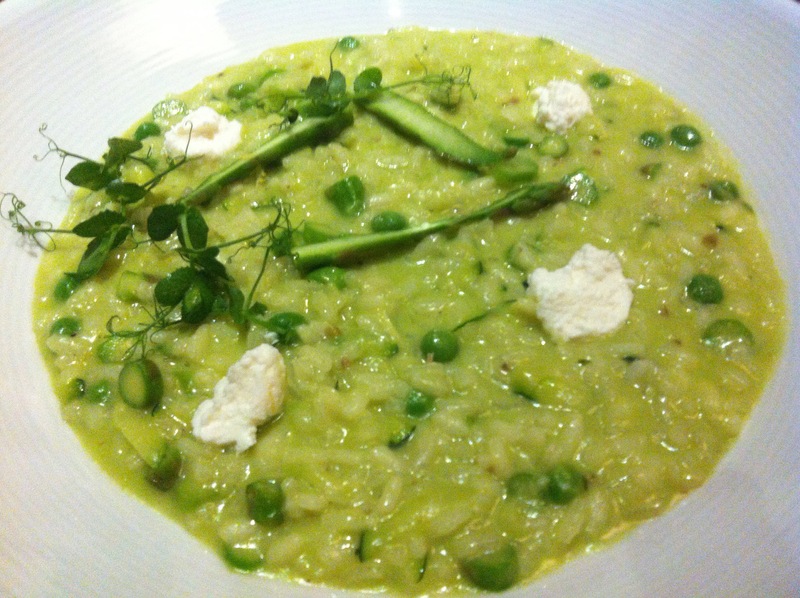 Asparagus, Pea, Courgette and Ricotta Risotto. 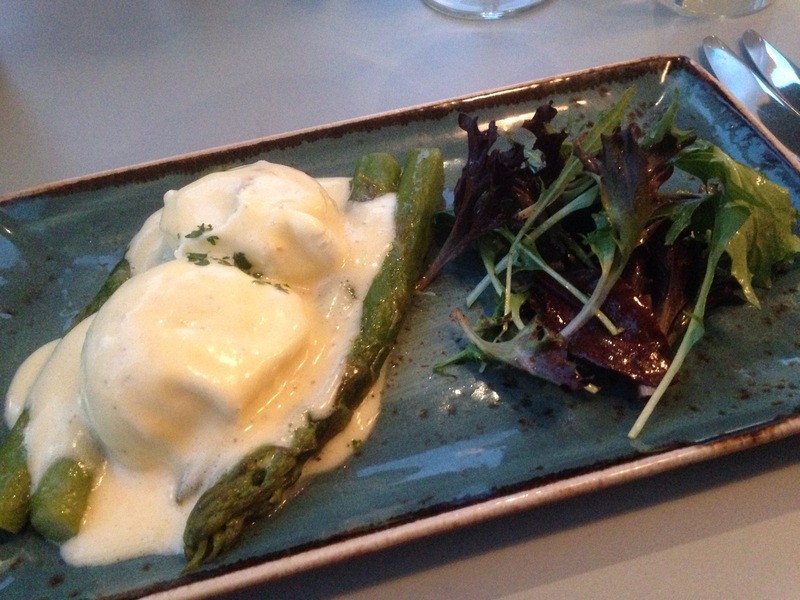 This dish surprised me with its gentle flavours and perfectly creamy texture. Throughout the dish the flavours of the fresh peas against the slightly charred courgette felt warming and surprisingly indulgent. A lovely risotto, one of the best I’ve had for years anywhere. I was pleasantly surprised. 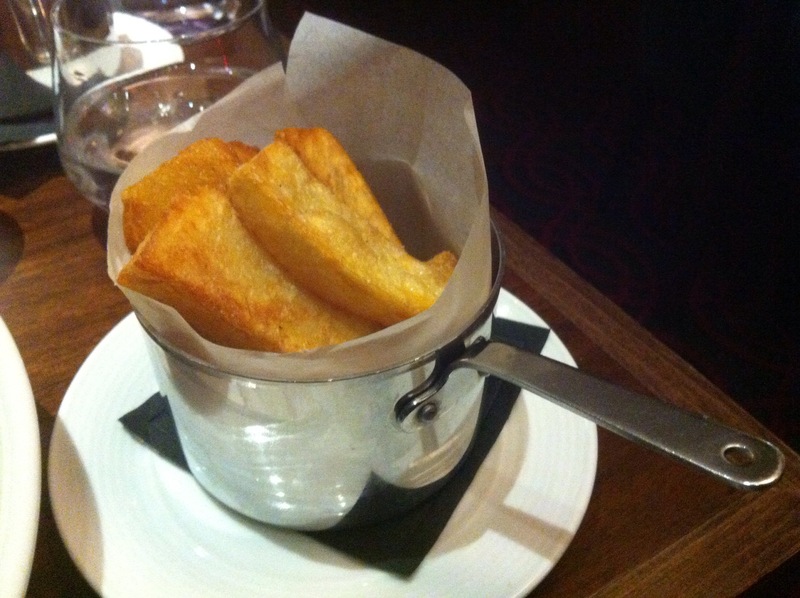 I also ordered some lovely hand cut chips because I have to Im afraid. I love chips. Beatutiful. 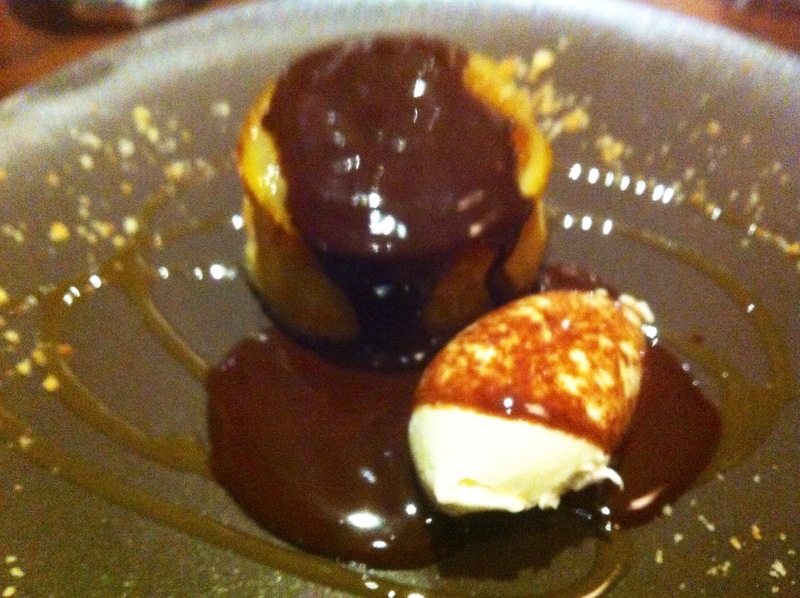 For pudding I chose a dish that I had heard rave reviews about, the pudding to have, the signature dish. 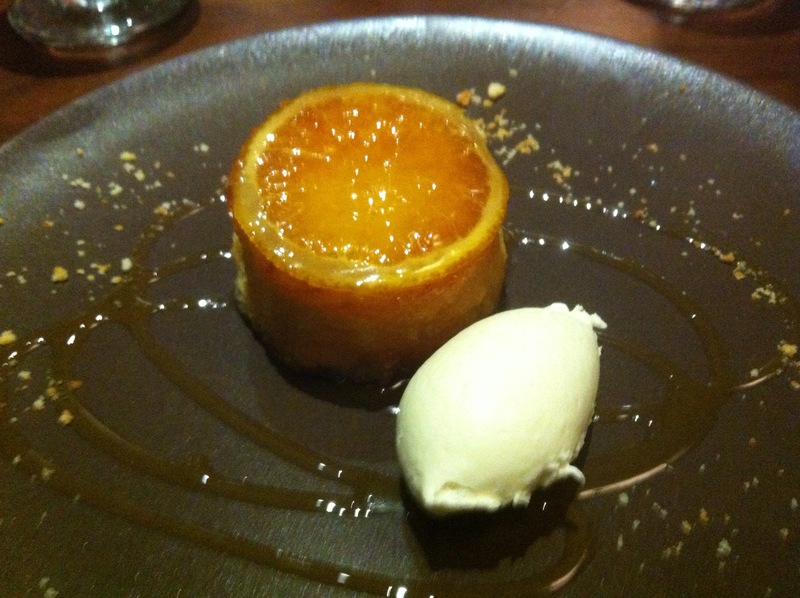 The Jaffa Cake Pudding, candied orange. It wasn’t a cake at all, but was the elements that make up one. The pudding was a joy. The orange served as a little mound of sponge with a candied orange on top and a pot of melted hot chocolate to pour over the top (as much or as little as you like) that was served with pistachio ice cream. A winning pud. At a winning restaurant, which if I’m honest surprised me. Grills are usually not great for veggies. La Tour Grill bucked the trend for simple well made dishes using well sourced ingredients, some home produced in their edible garden and a smart, relaxed dining room. The quality of the ingredients did show through. I think this element made the real difference to the vegetarian dishes which at face value seemed simple but on taste much more complex. 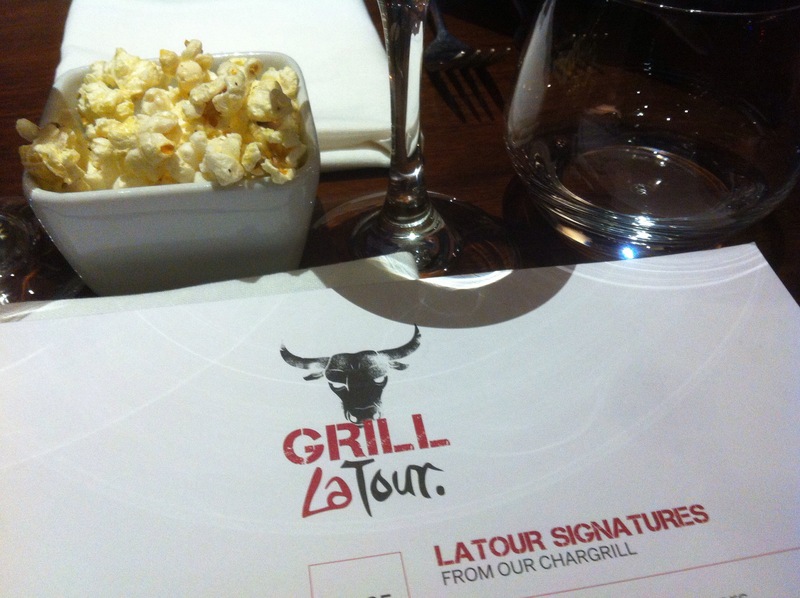 I expected La Tour Grill to be a bit pretentious, but found the service friendly, professional and relaxed. All served as I’ve said in a lovely dining room. The eating was the pleasure, and though the Brasserie wasn’t anywhere near full, it felt intimate and romantic. The hotel and restaurant are ideal for dates, a night away, or a romantic drink in an excellent hotel bar. A sophisticated treat. Try it. We headed back to the bar to sample the Whisky’s and brandy’s. A long list but someone had to do it. We sat next to the piano, no one was playing, but we could hear the gentle music swish through our minds like soothing harmonies. I’ve also heard rave reviews from fellow bloggers about the afternoon tea. Bring it on. La Tour Grill has also a chefs table near the kitchen. We had a view of the kitchen without the chefs table service. The table there seemed to be enjoying their experience. Next morning we took breakfast in the Brasserie- a hot and cold buffet, of numerous breakfast items. The veggie breakfast items were good, though no veggie sausage. Very pleasant, without been overwhelming. We enjoyed once again lovely service and it was a good way to end our short but very sweet stay. A short walk from new street and Moor Street Stations. We paid for our stay and meal in full all opinions are my own and honest. We thank the hotel staff and restaurant staff for helping us to have a lovely one night stay. 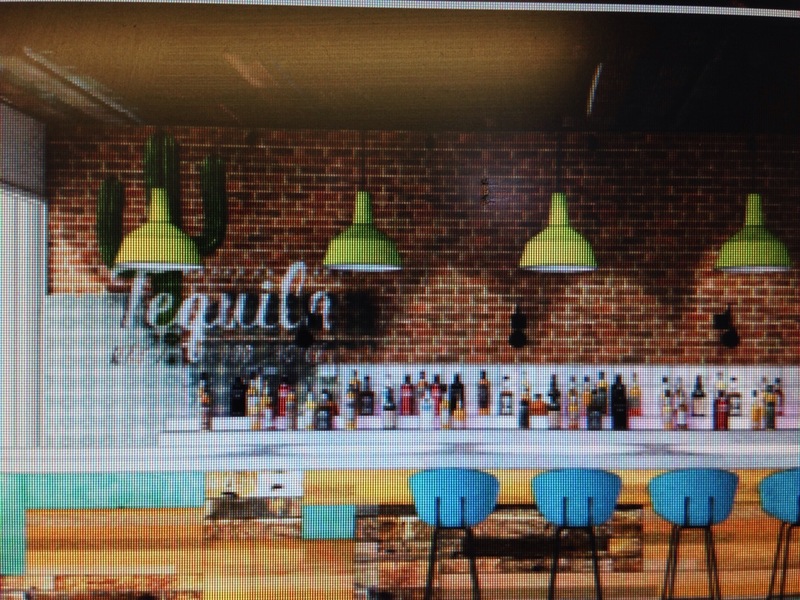 There are two new bars/restaurants opening in November 2014. 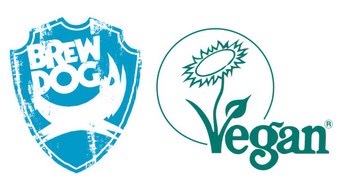 Both of which will be superb for vegetarians and be a classy addition to Birmingham and to Worcester. The first is Bar Opus from the Opus Team who will be opening their third venue after their Opus Restaurant on Cornwall Street and Cafe Opus in Brindley Place in Birmingham City Centre. 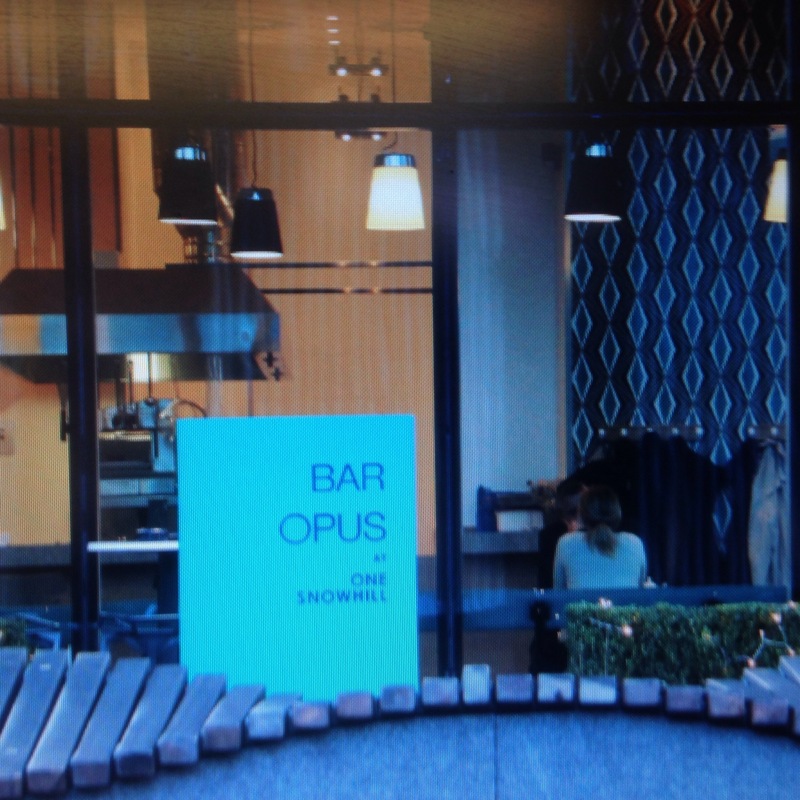 Bar Opus will be based in a new Snow Hill complex near the railway station in the Colmore Business District and adjacent to the new Midland Metro line due to open in 2015. 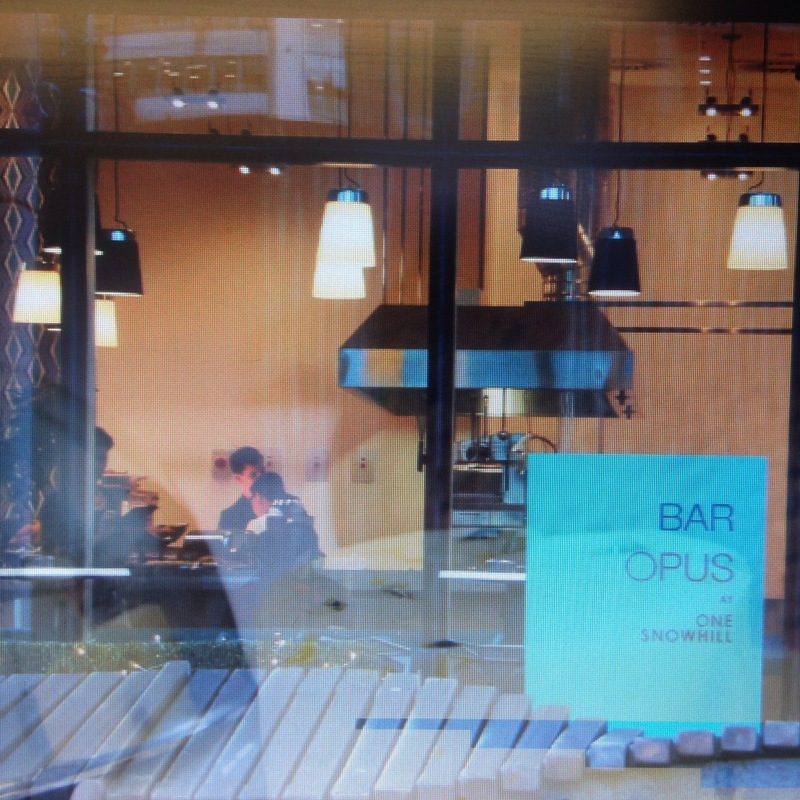 Bar Opus will be open for breakfasts, and lunch, but it is the after 5pm hours where the bar will come into its own. Its inspiration will be Barcelona and Copenhagen, offering shared plates of food created from an open kitchen. There will be good vegetarian options. 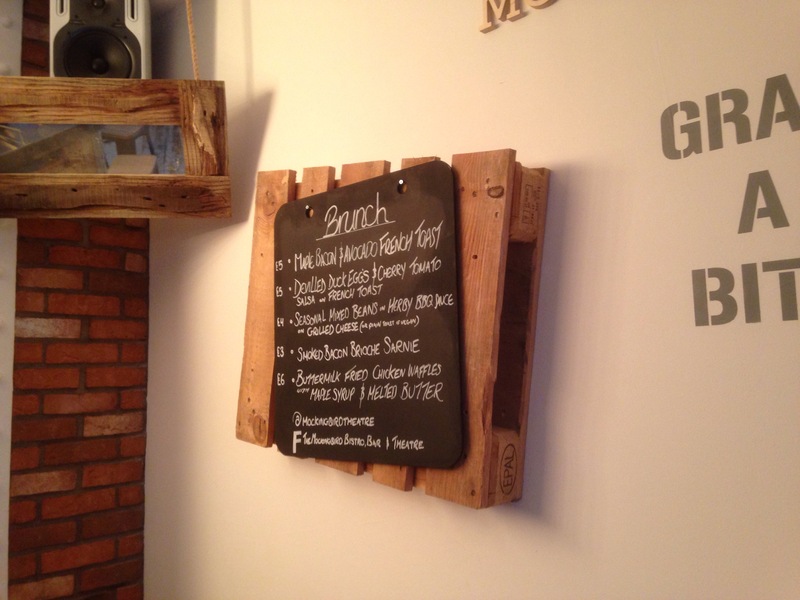 The ethos will be the same as the other restaurants, well sourced local produce, creatively delivered with a twist. 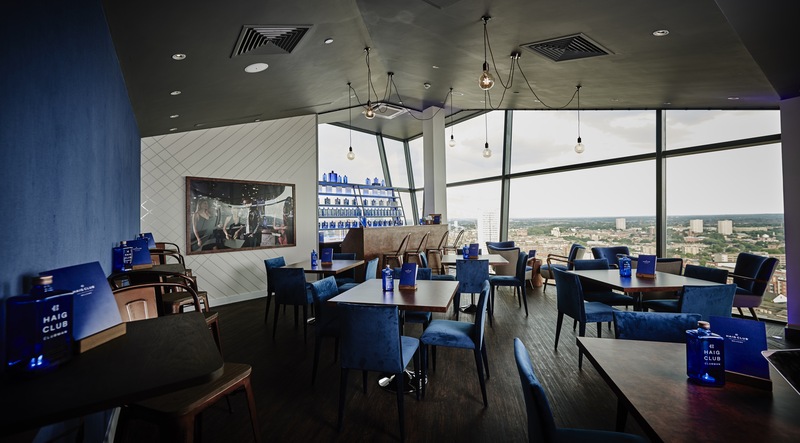 Bar Opus will also have a terrace on the piazza of the new One Snowhill building which should enhance the continental idea, ableit in the Summer months. 🙂 a full wine, cocktail and drinks menu will be available. 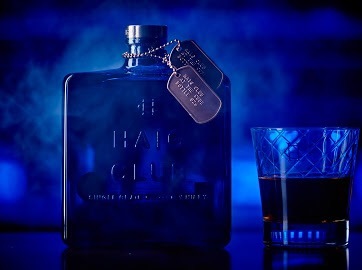 It’s a city bar redefined. 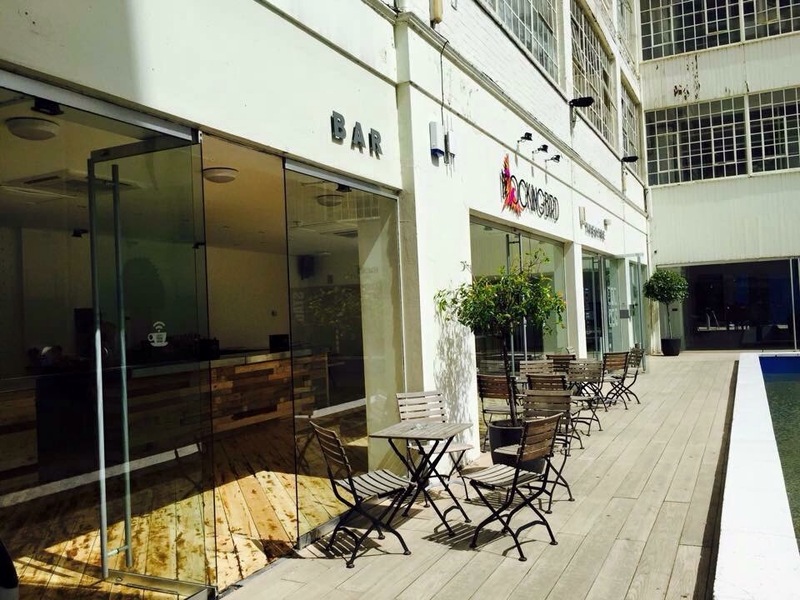 Bar Opus is due to open its doors on the 6th November 2014. 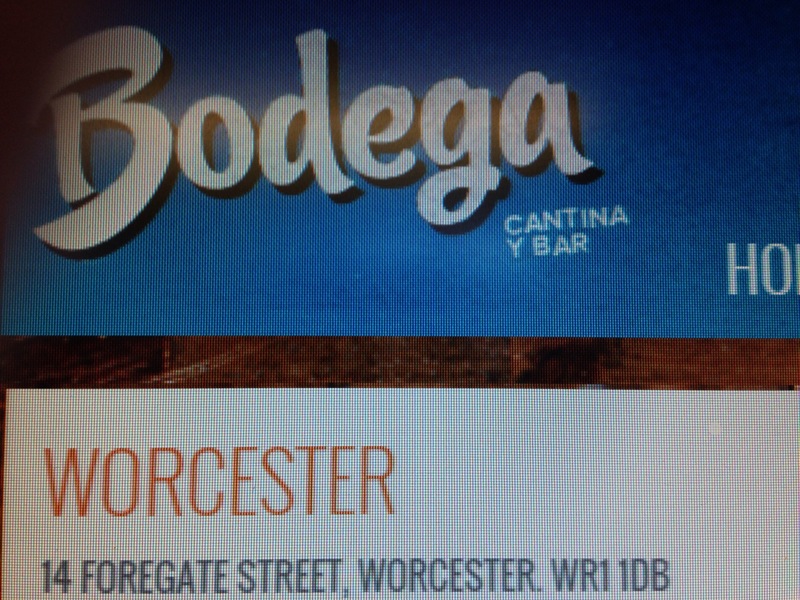 The second #TastyMorsel is in nearby Worcester where the fantastic Bodega Cantina will be opening in November. 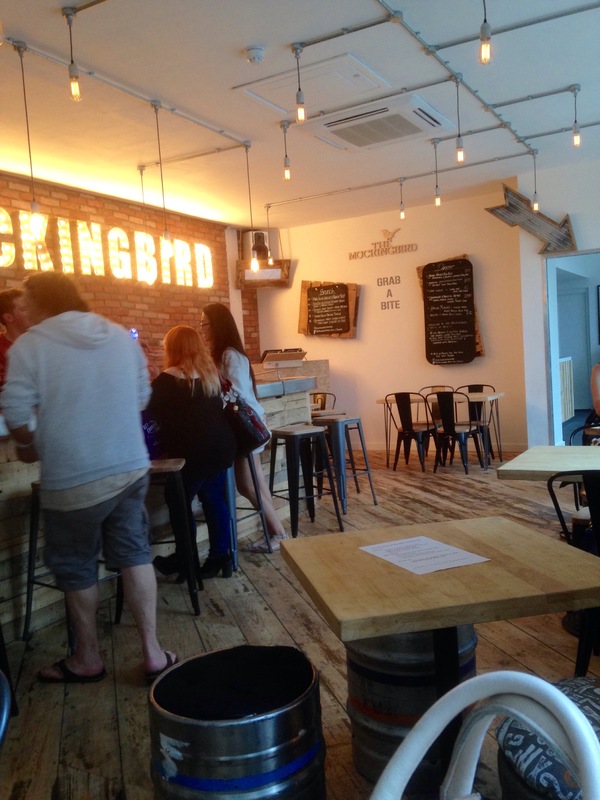 Bodega owned by the Bitter N’ Twisted group already have a very successful and veggie friendly bar/restaurant in Birmingham City Centre which is superb. 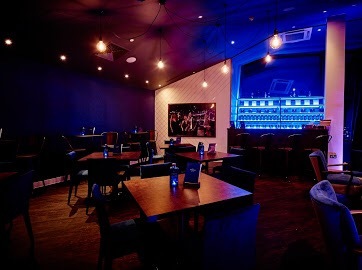 Bodega are known for their hand crafted cocktails and delicious food in equal measure, will be offering their authentic South American food-Burritos, nachos, and tacos with a large vegetarian selection. It will be right next door to Foregate Street train Station. They are not taking bookings as yet, but keep an eye on their website, facebook page and twitter page for details, or you can sign up for their mailing list on their website. 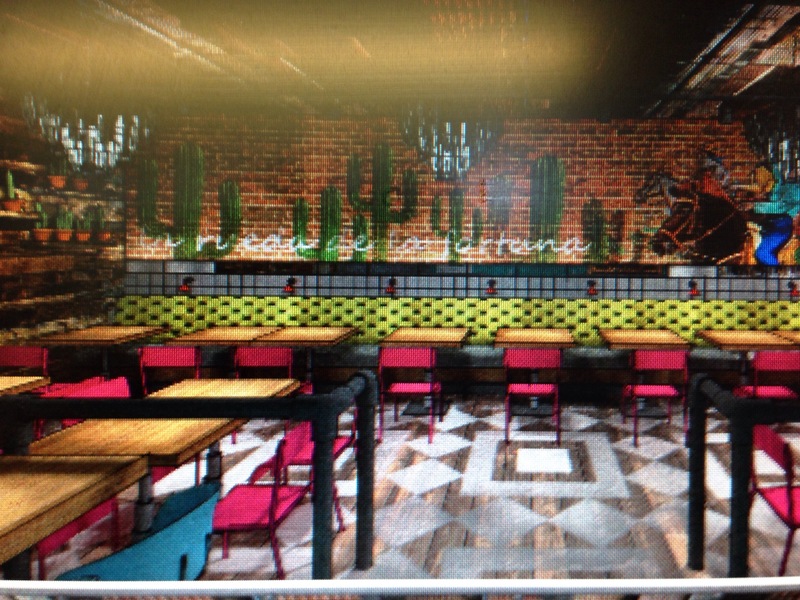 Bodega will also be offering their Go Go Burrito take away service. All being well Bodega will be opening in Worcester at the end of November.